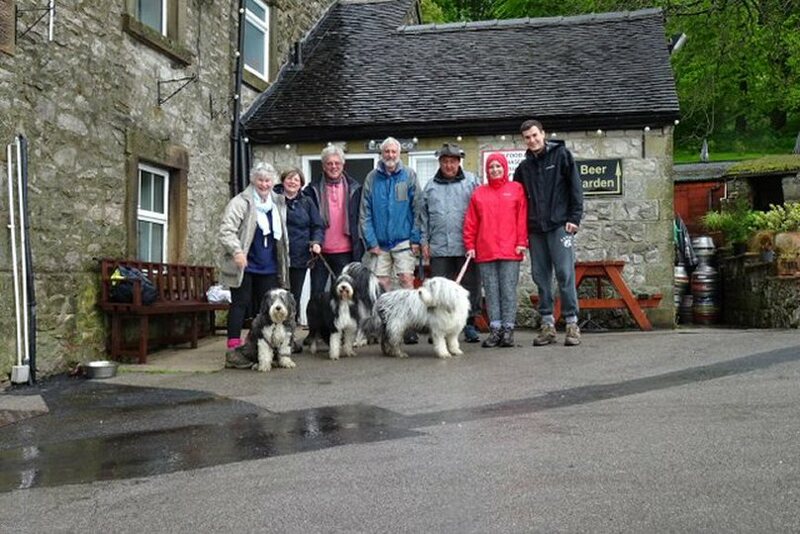 The weather predictions were not good for the first of the two Peak Weekend rambles but we did manage to get to the half-way lunch stop at Crowdecote before the rain set in. 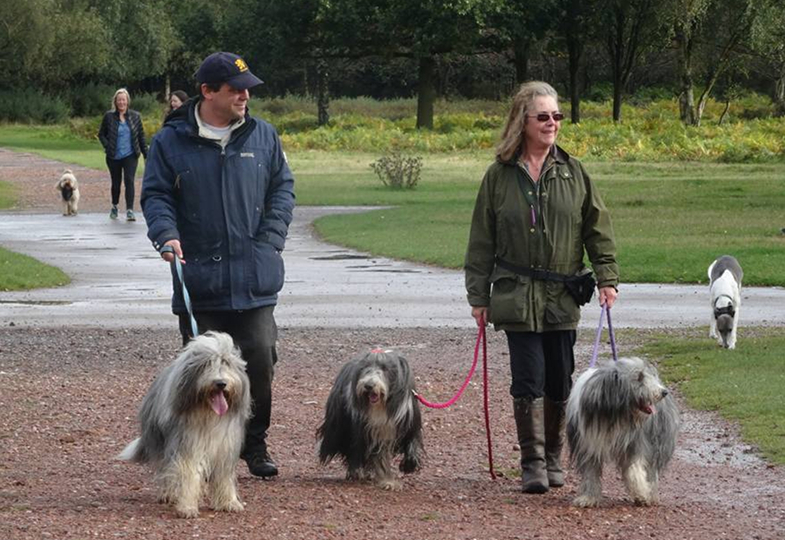 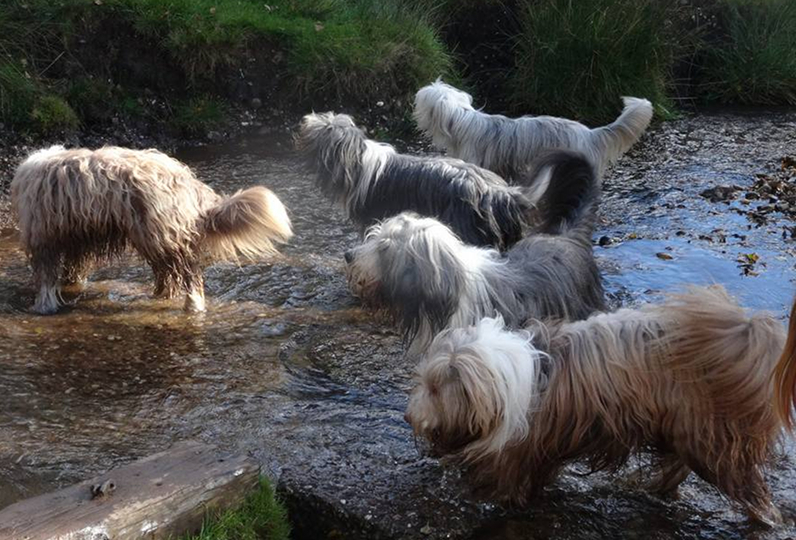 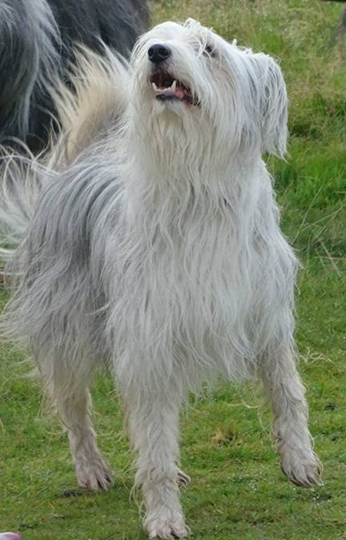 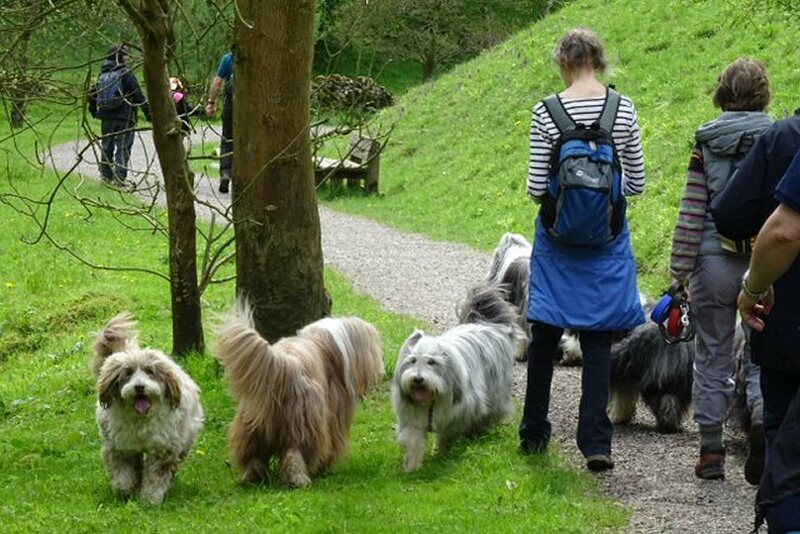 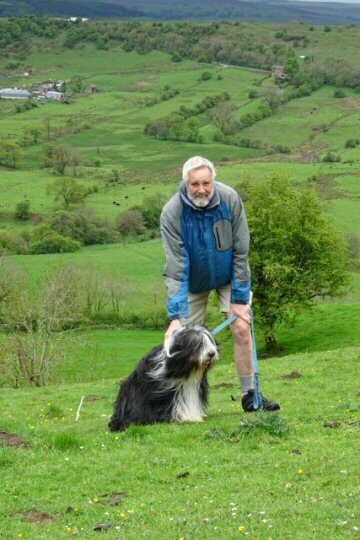 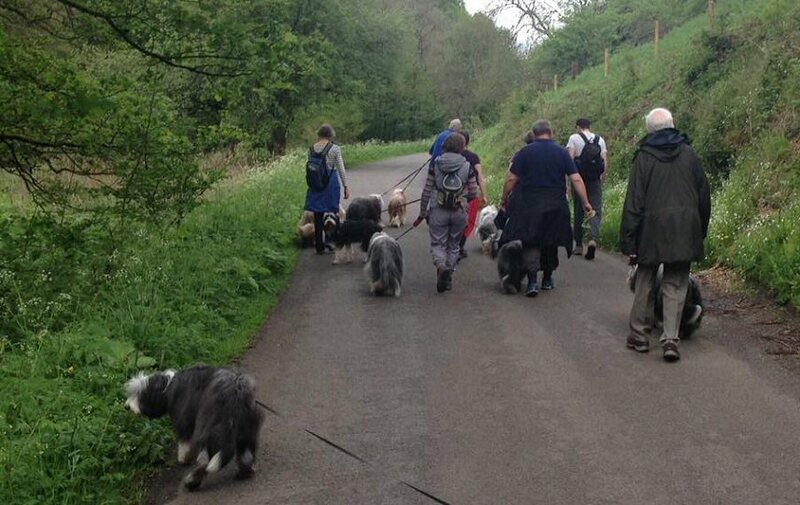 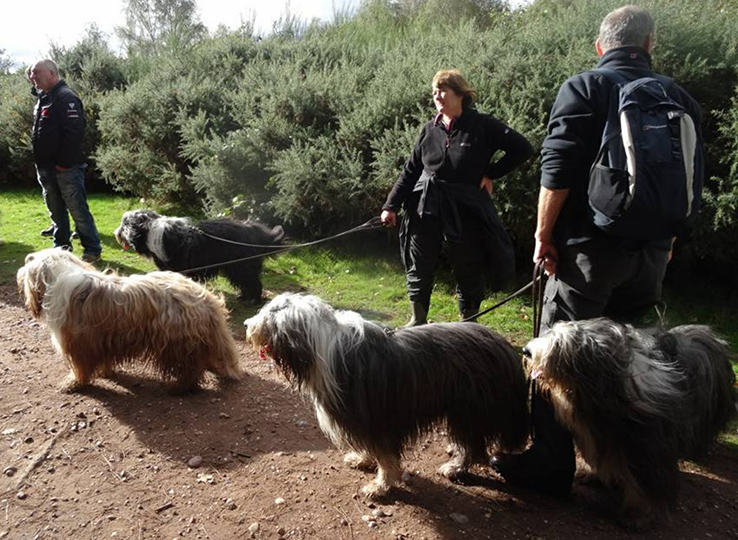 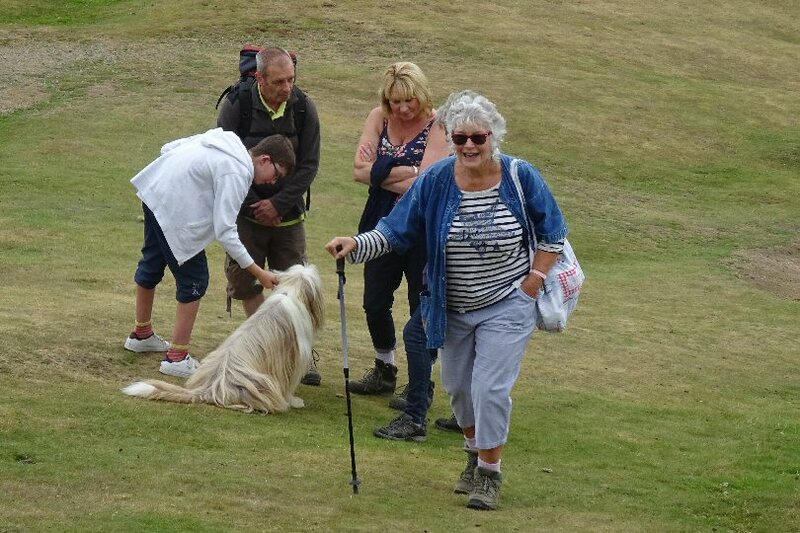 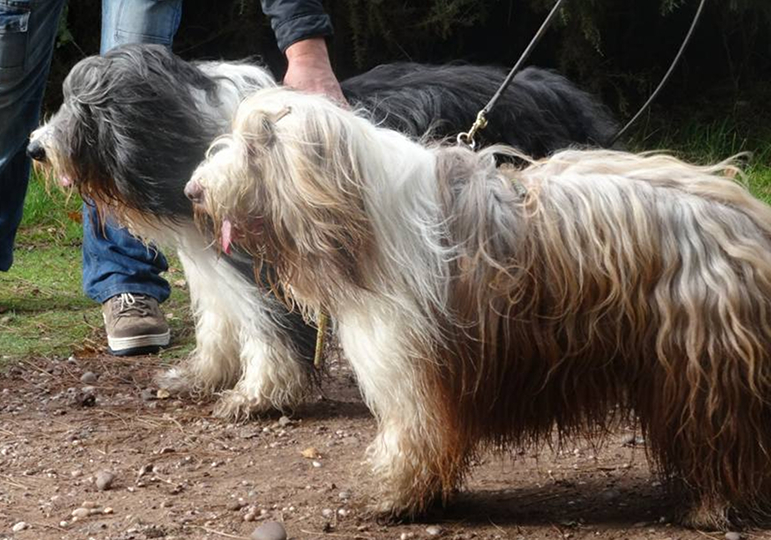 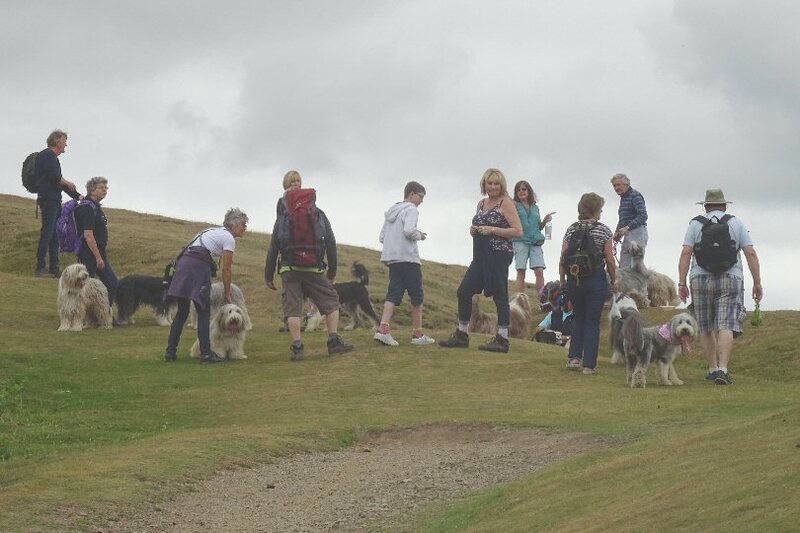 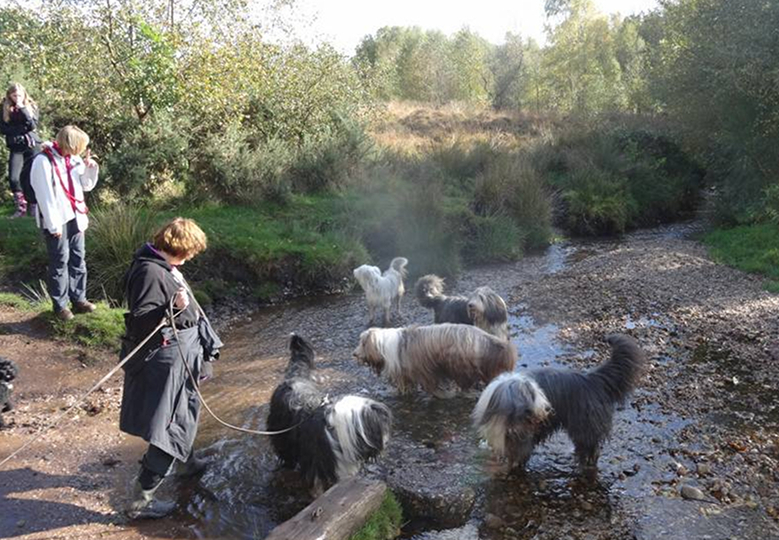 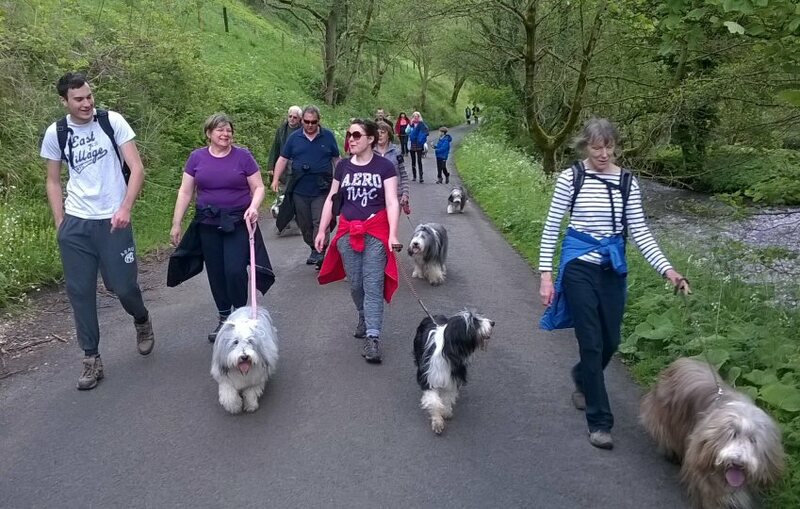 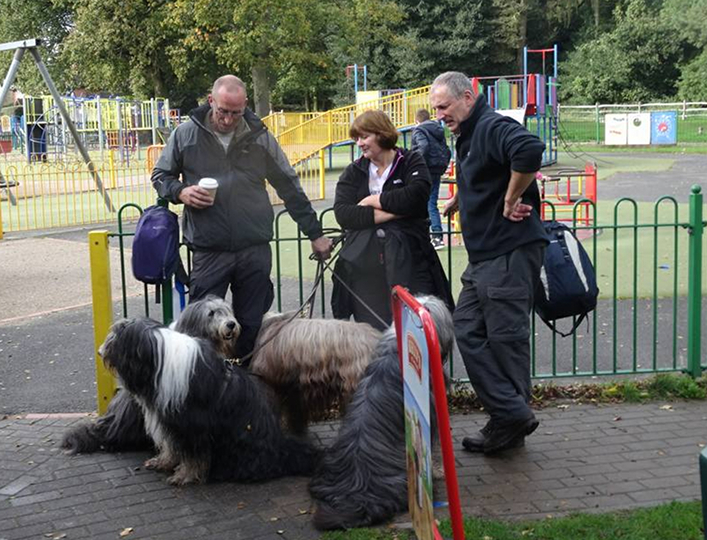 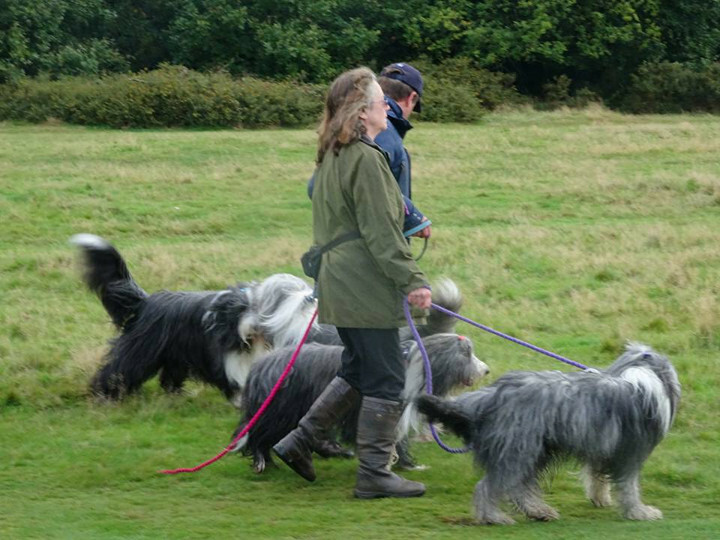 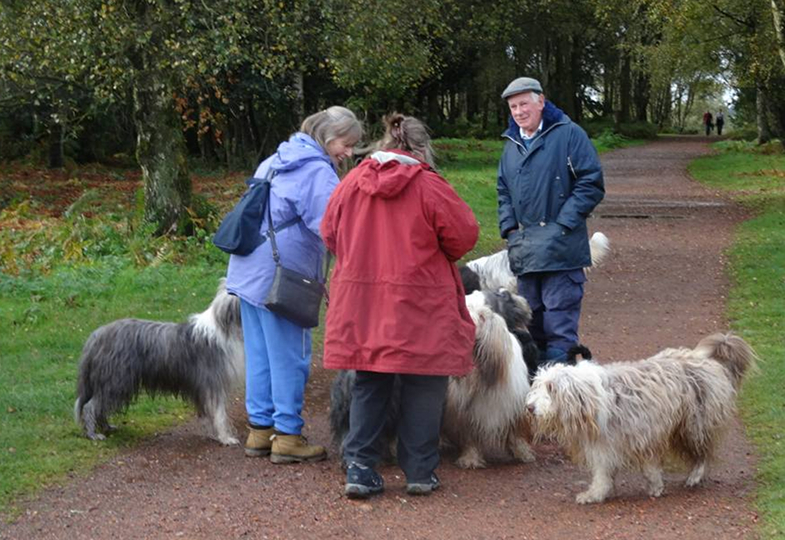 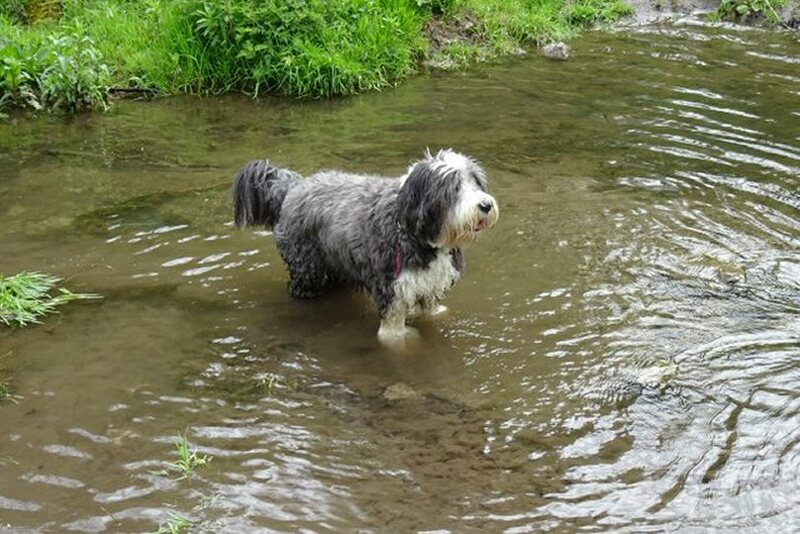 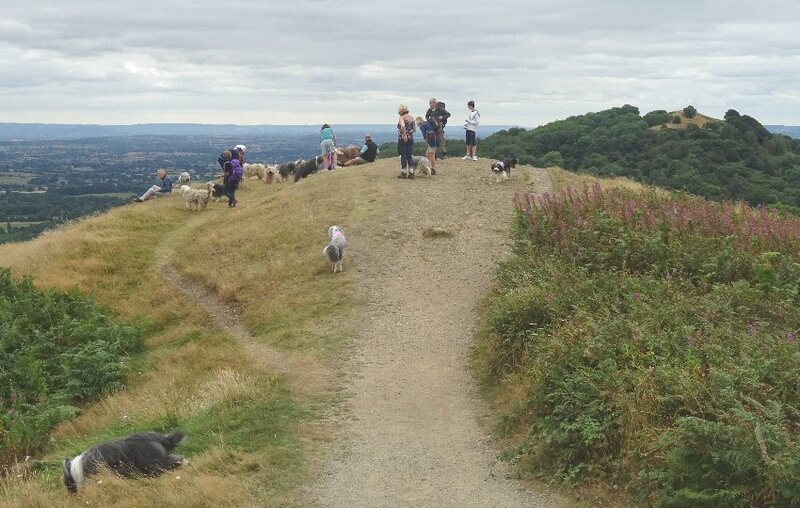 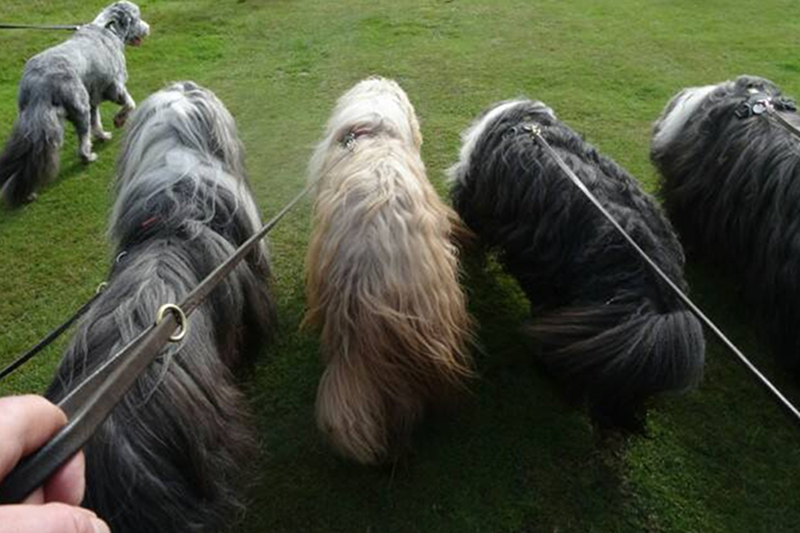 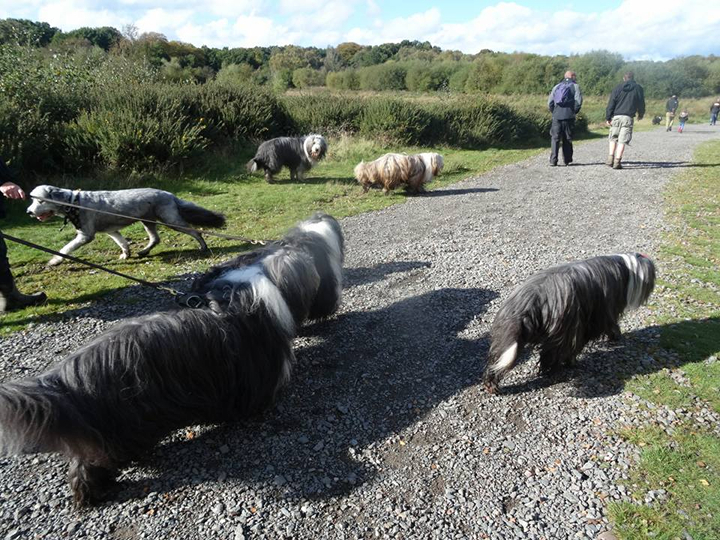 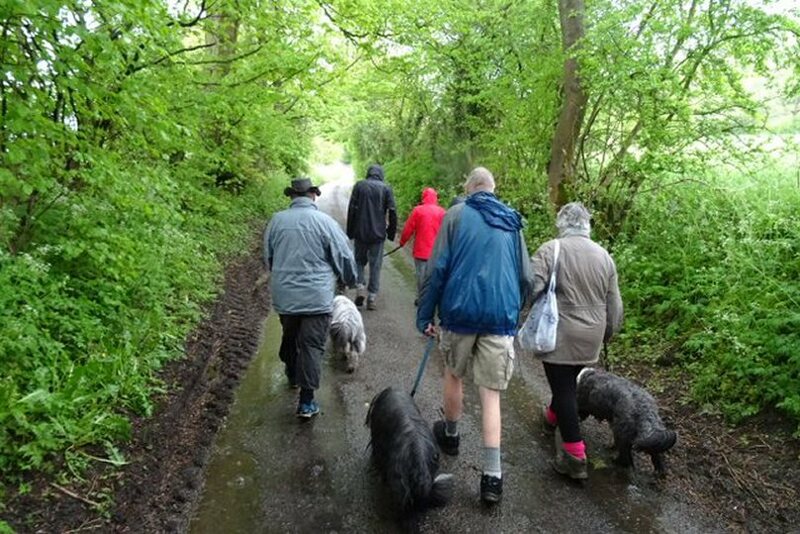 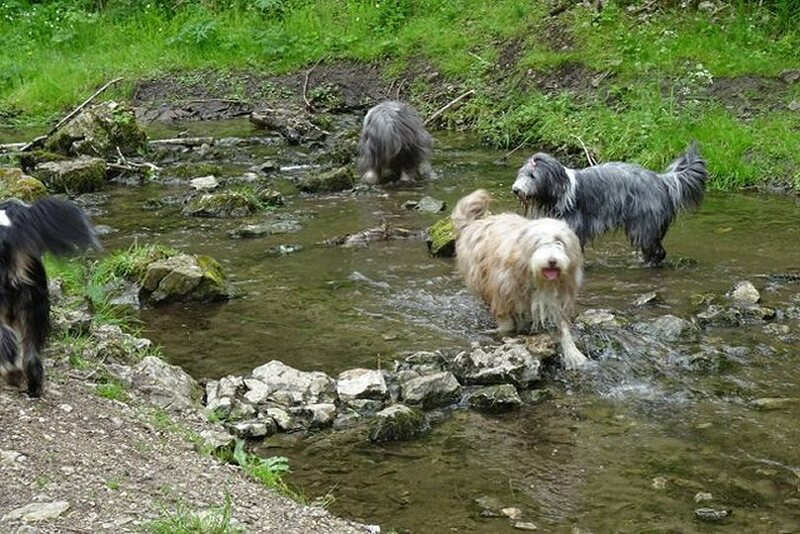 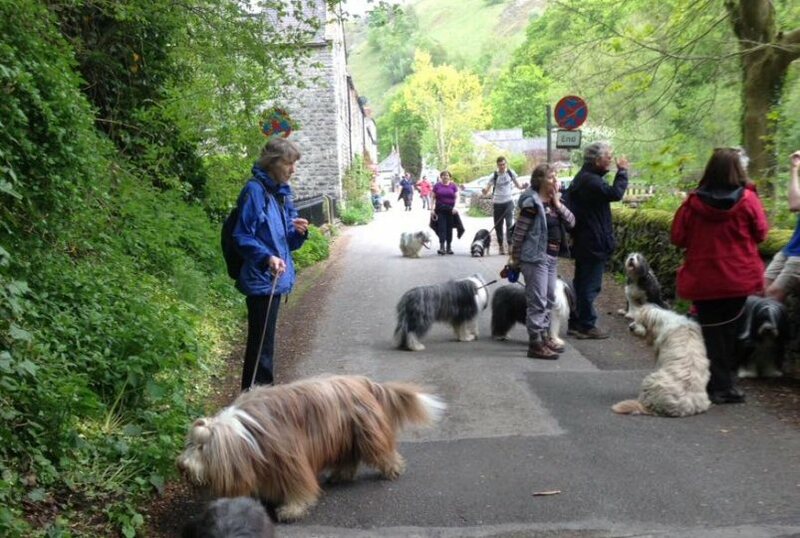 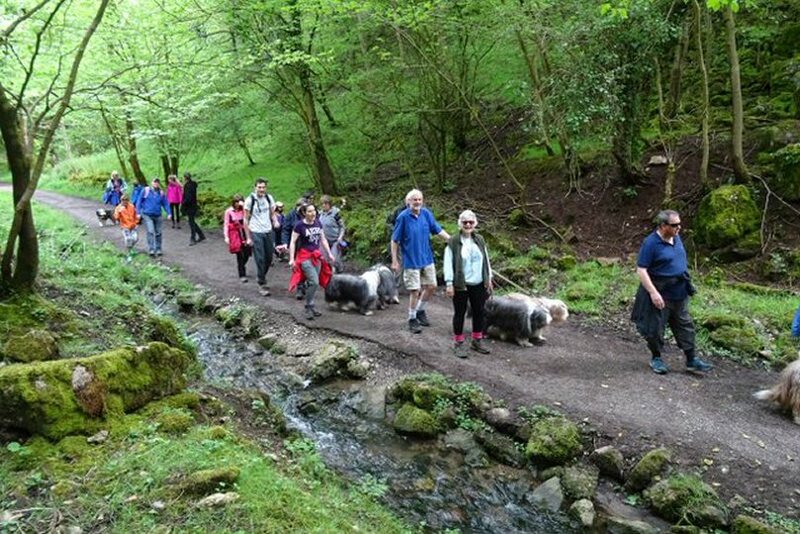 Perhaps understandably, the turn-out for this walk was as dismal as the weather - just seven people and only four Beardies, but the banter and tucker were very enjoyable. 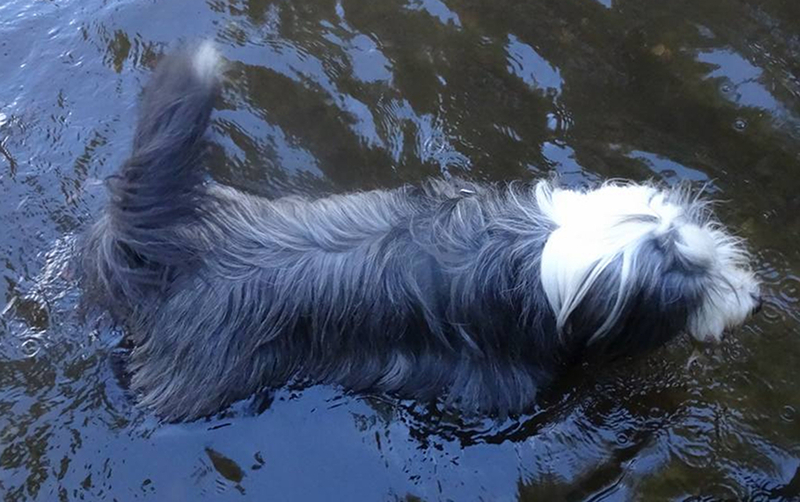 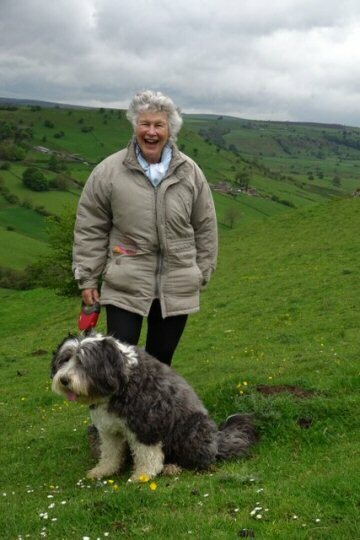 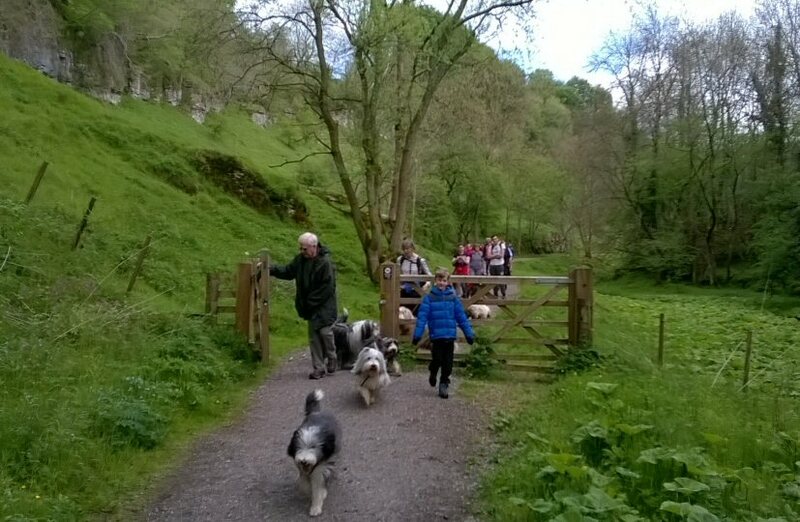 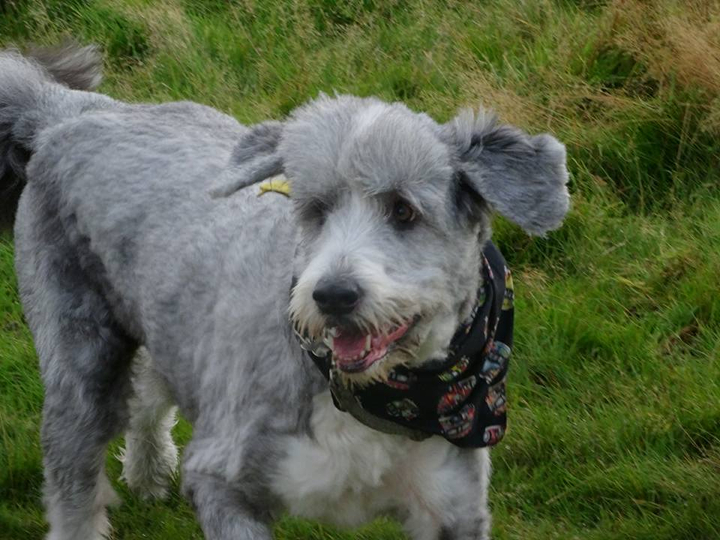 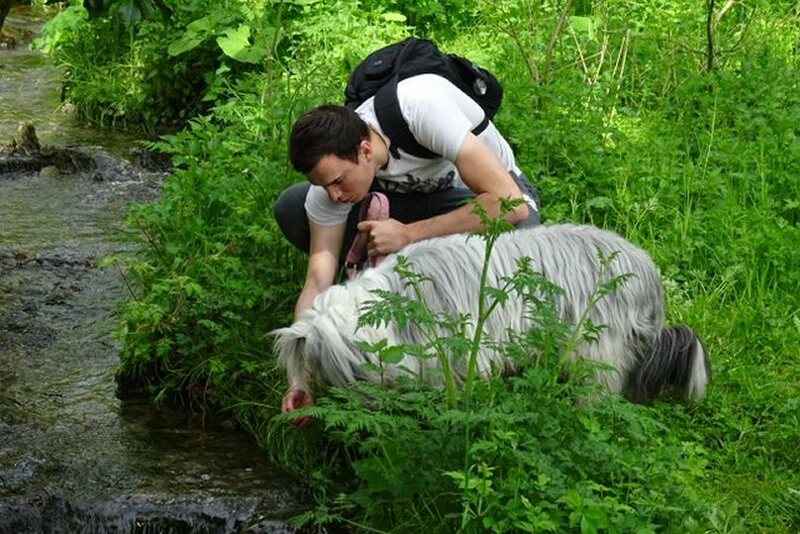 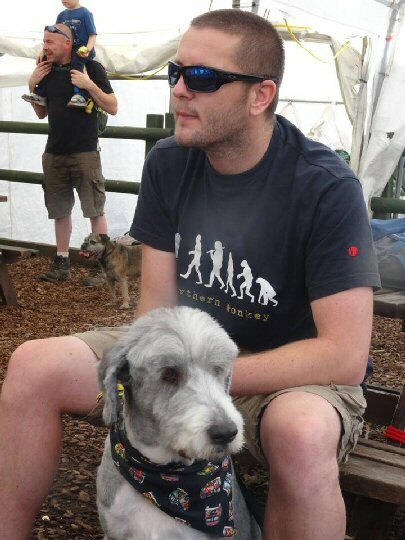 Dovedale felt as peaceful as ever! 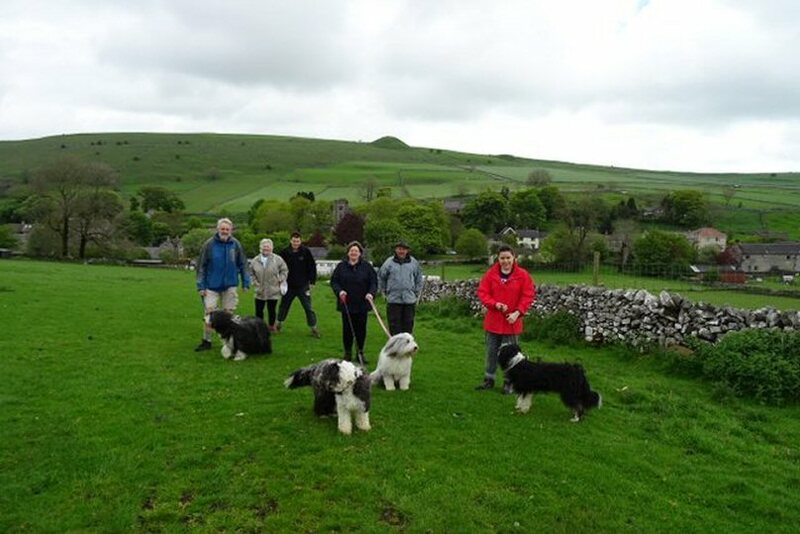 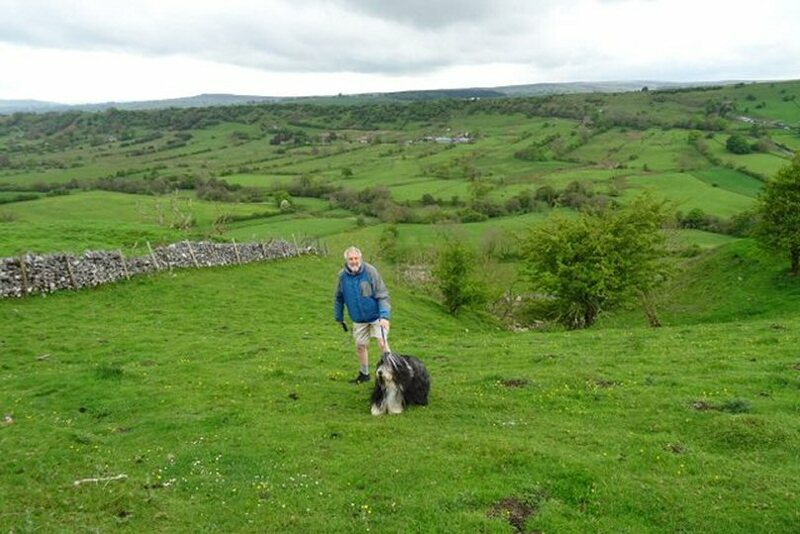 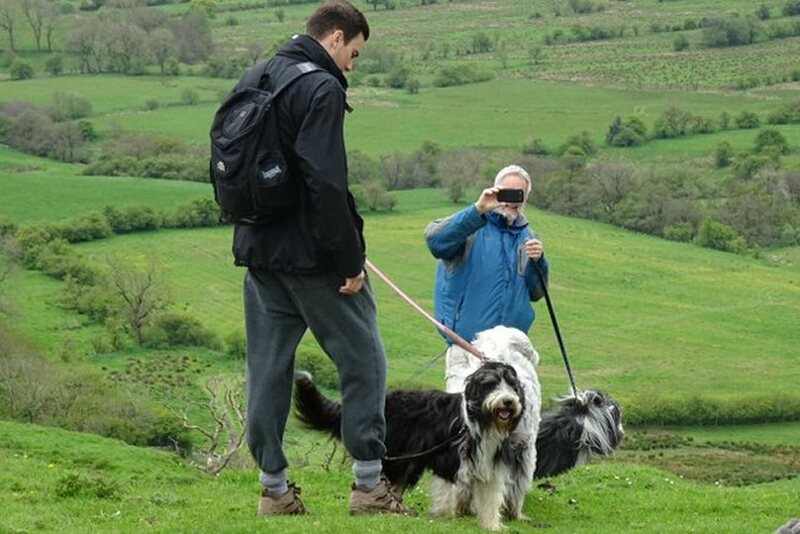 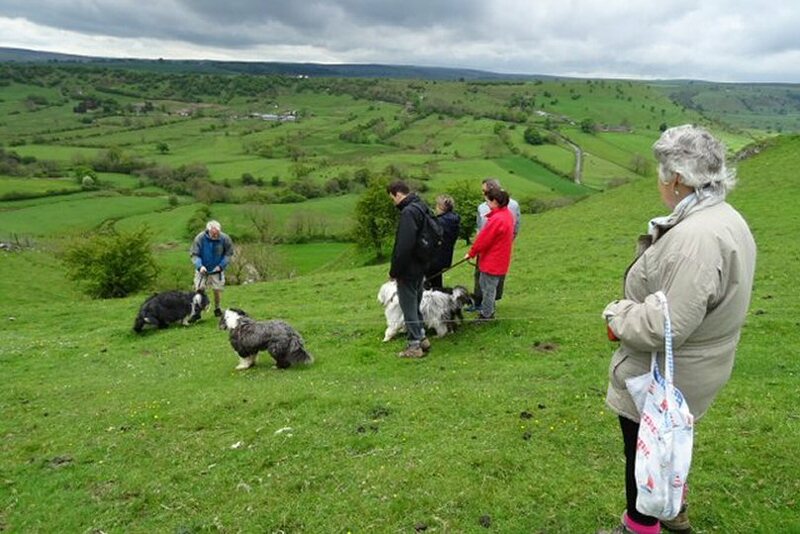 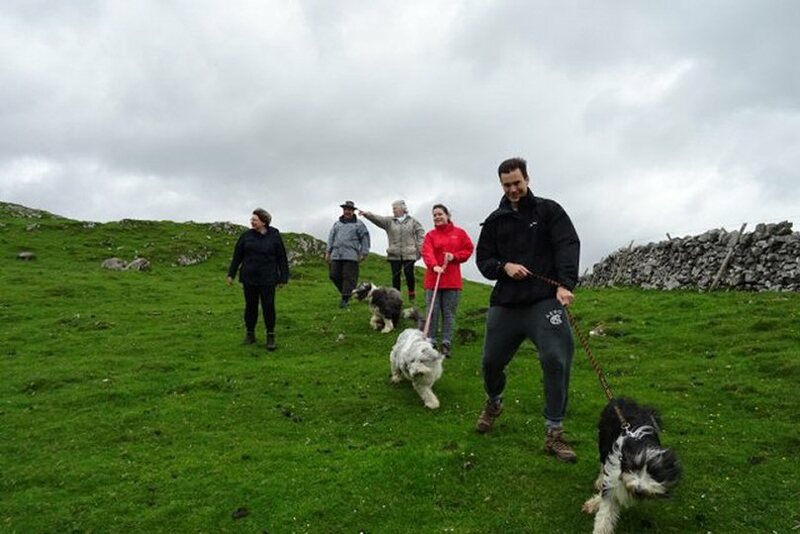 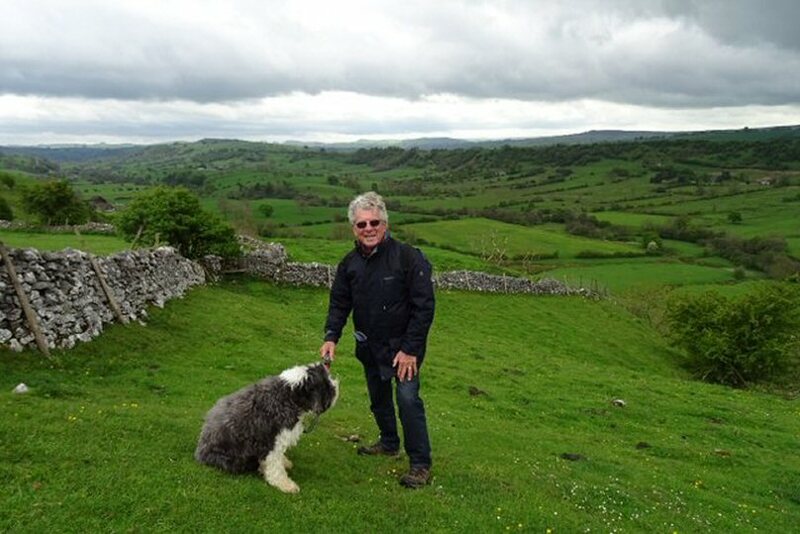 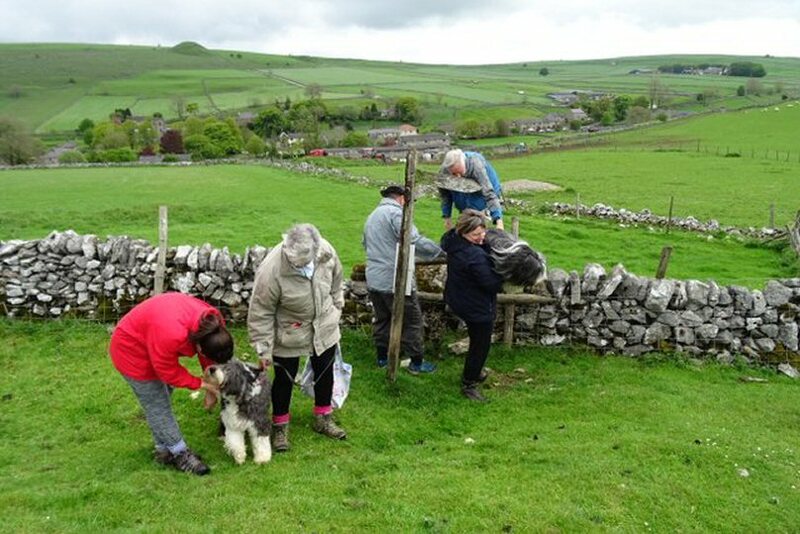 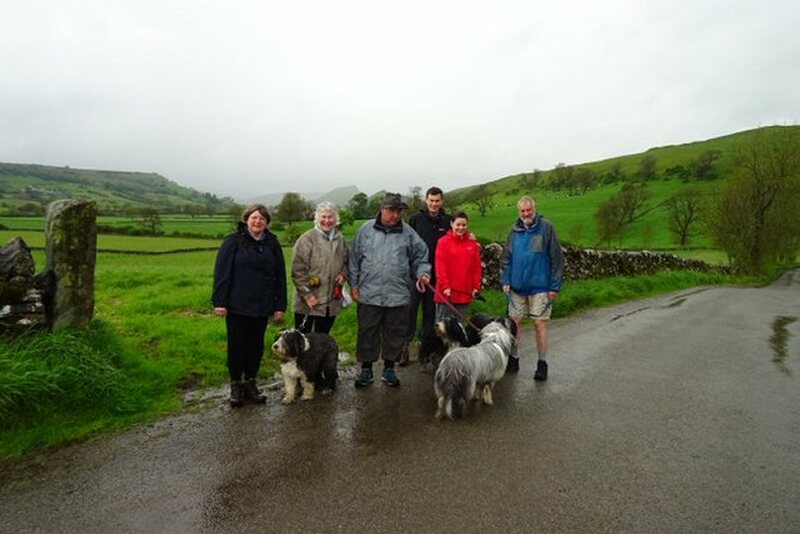 In complete contrast to the weather of the previous day, around twenty members, prospective members and their Beardies enjoyed superb walking around a circuit which took in Tideswell, Millers and Litton Dales. 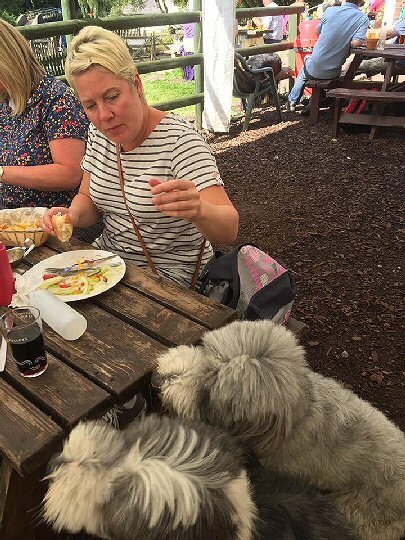 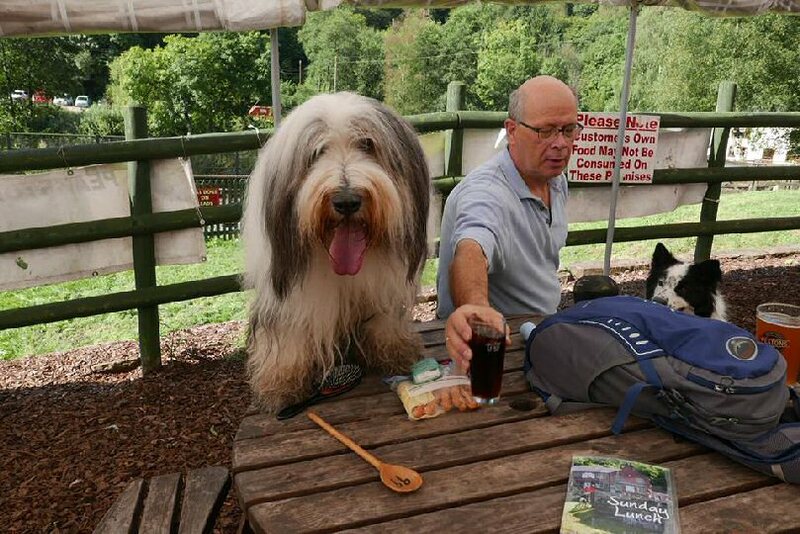 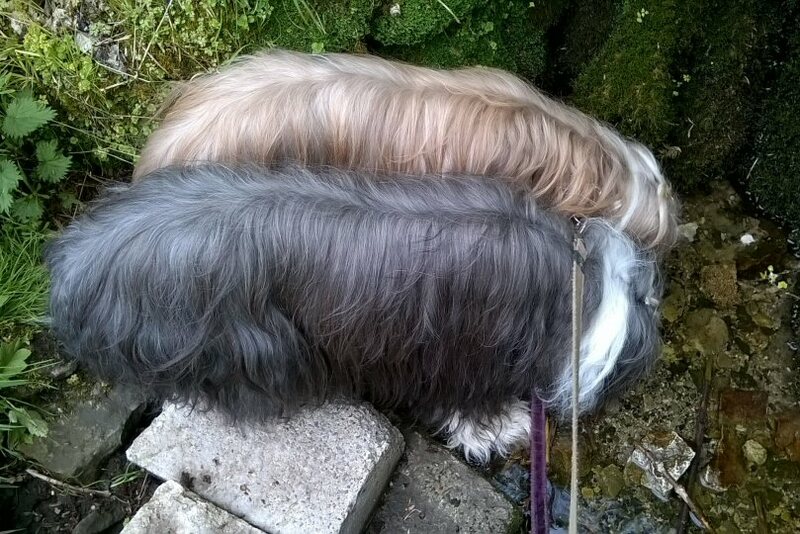 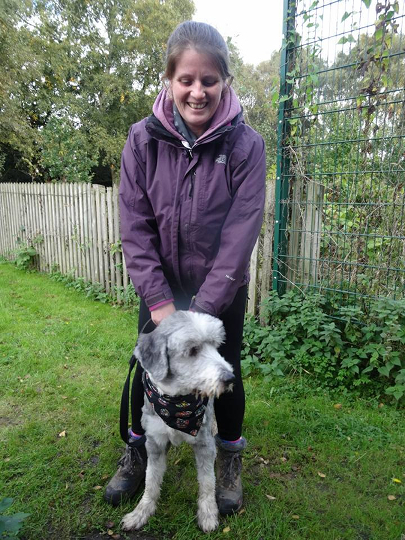 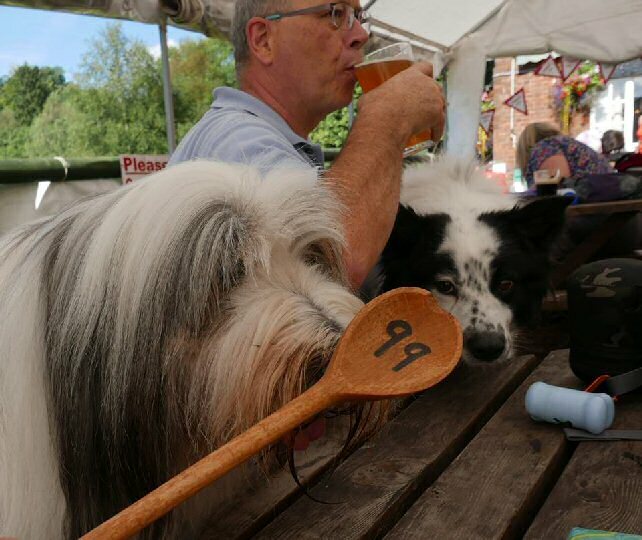 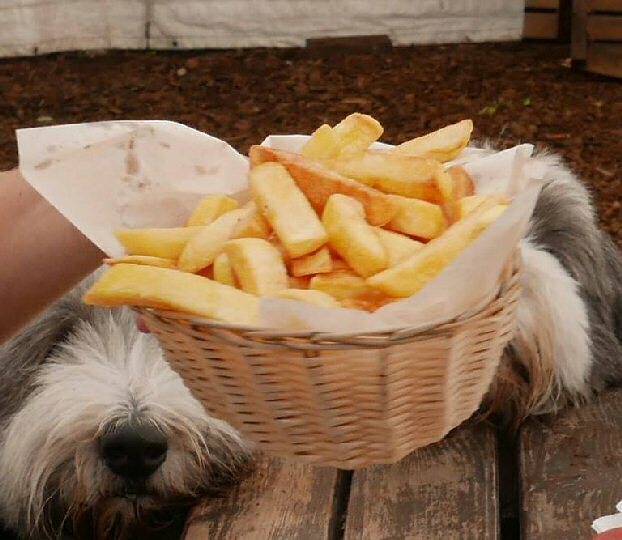 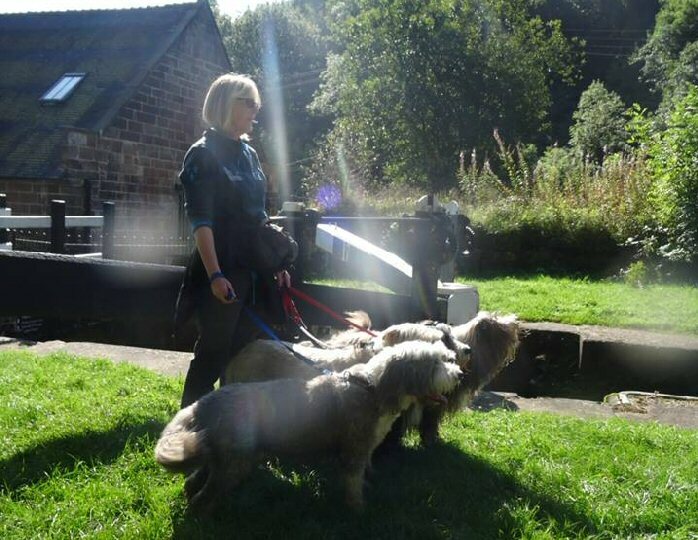 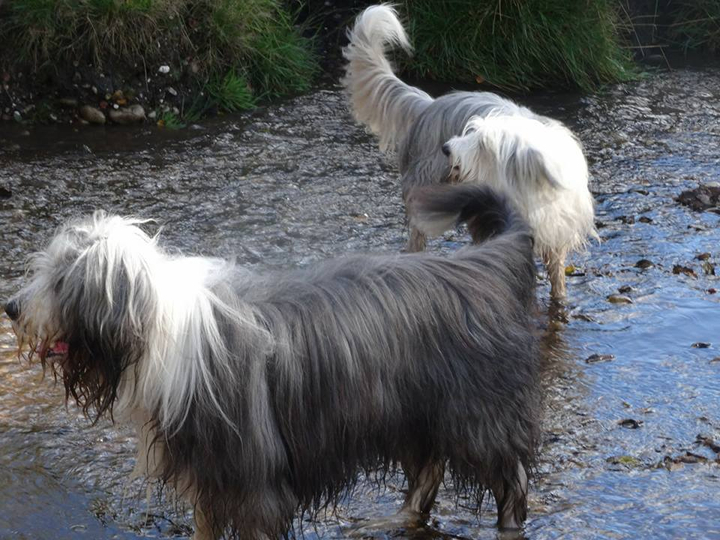 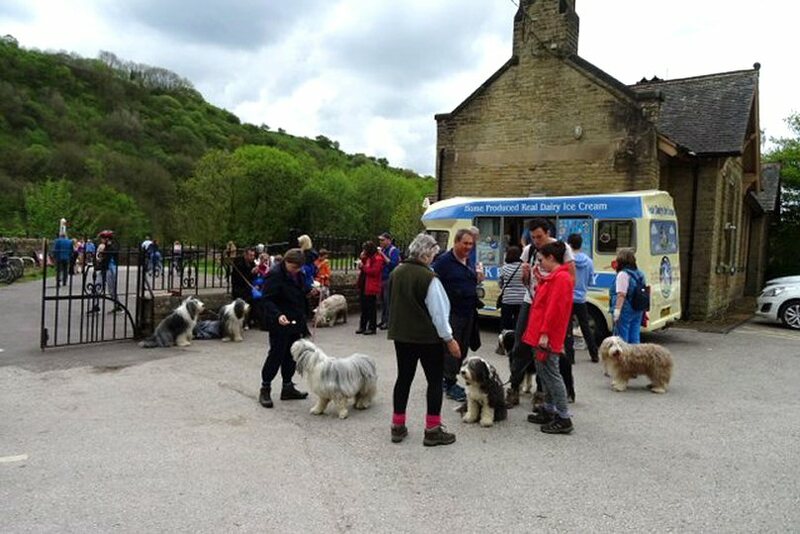 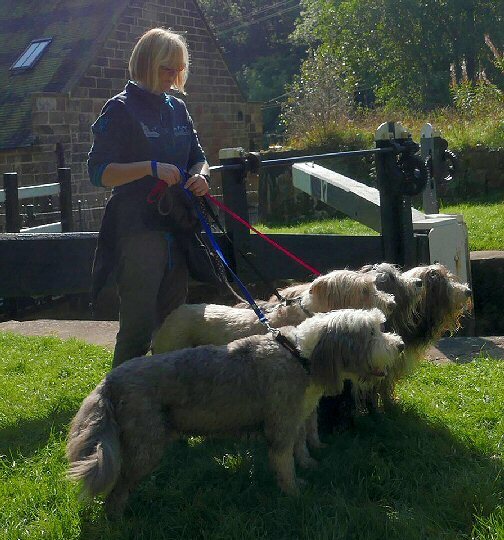 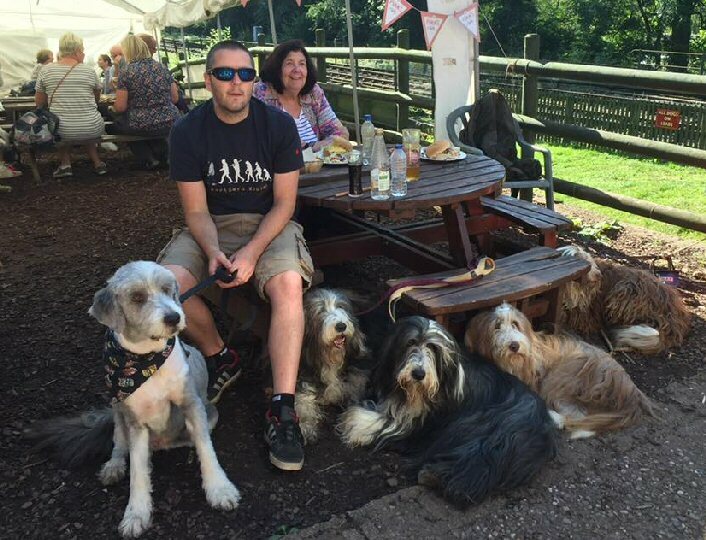 Lunch was taken at the Angler's Rest inn at Millers Dale where the landlady made sure all the dogs received dog biscuits. 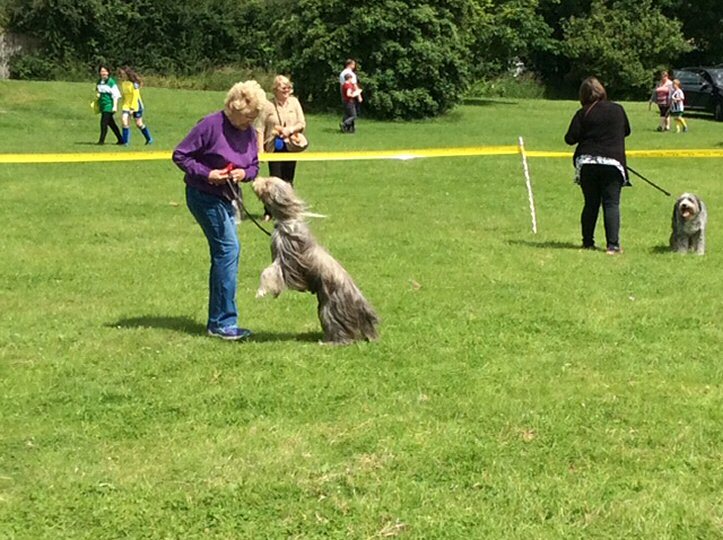 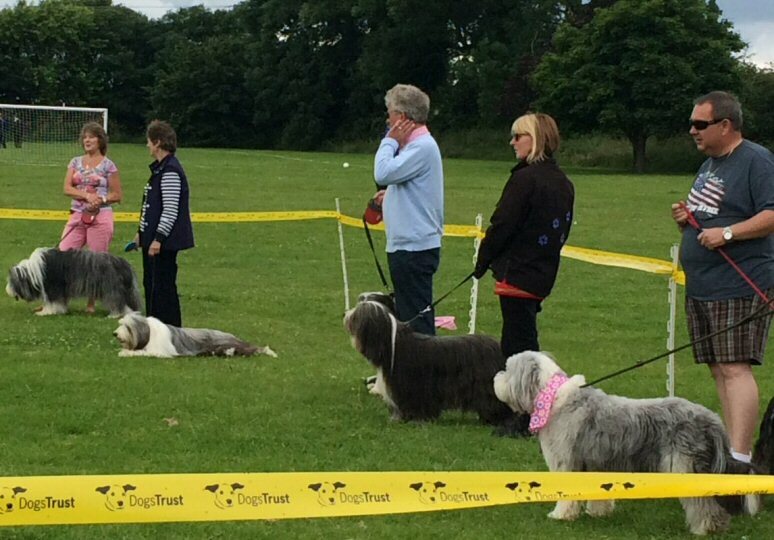 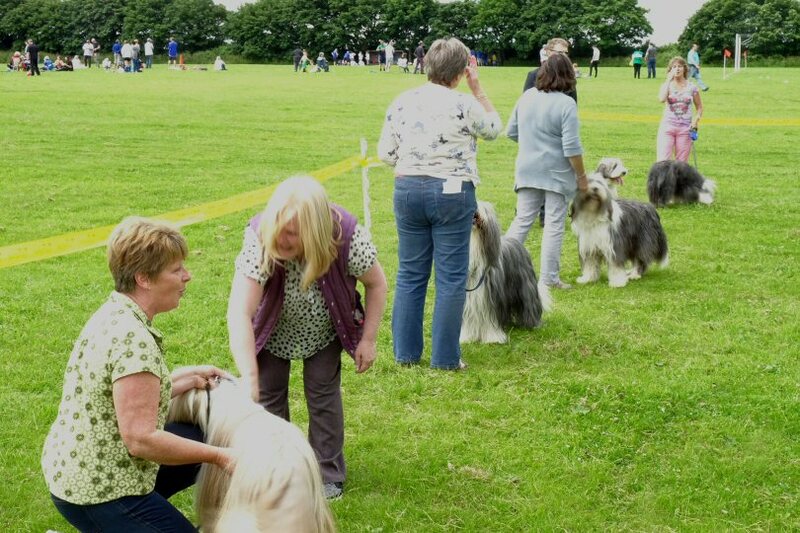 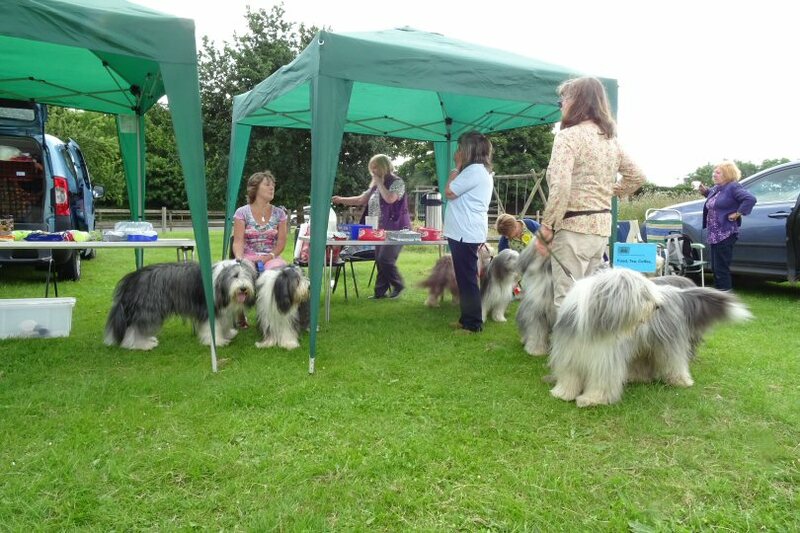 The weather remained fine throughout and everyone agreed how enjoyable a day it had been for owners and their Beardies alike. 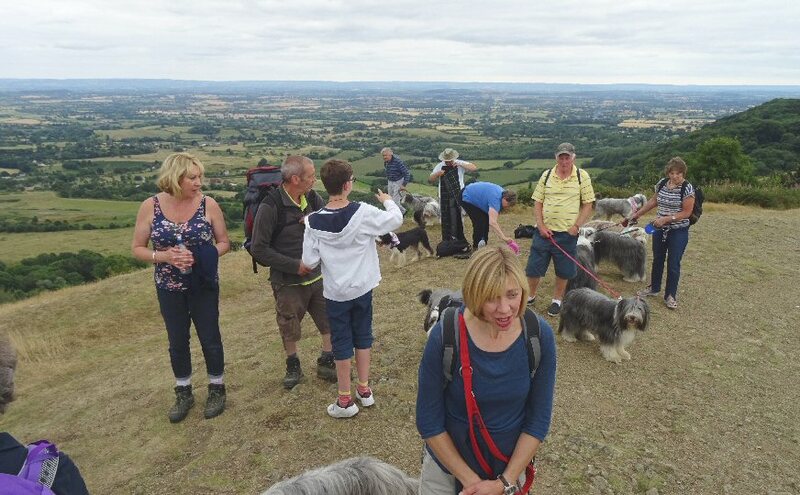 Surely a ramble to be repeated sooner rather than later? 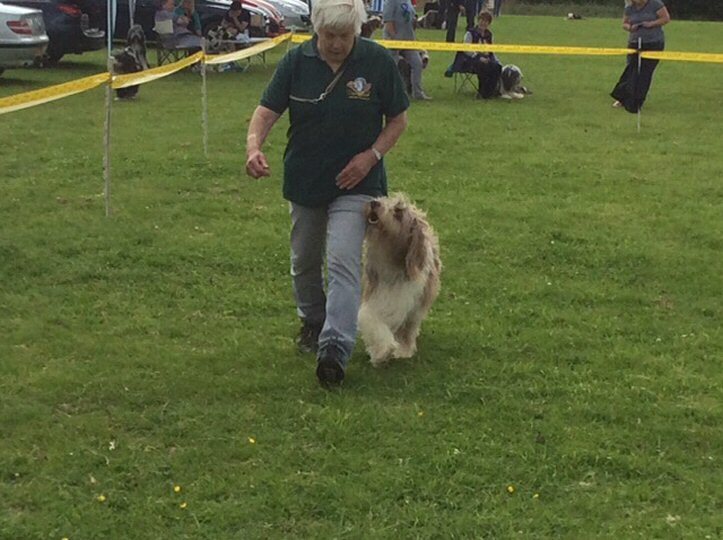 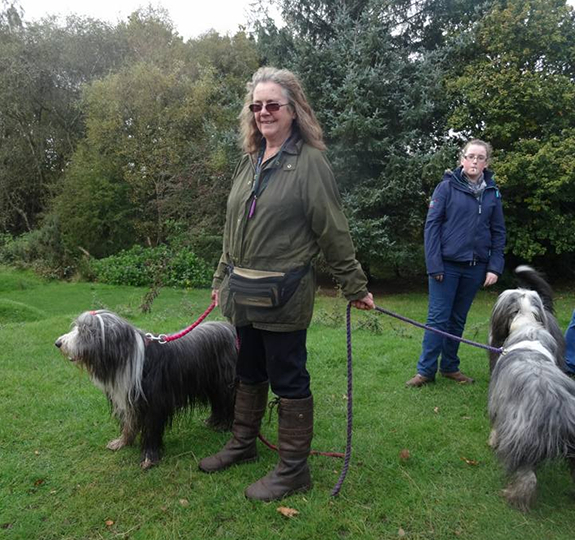 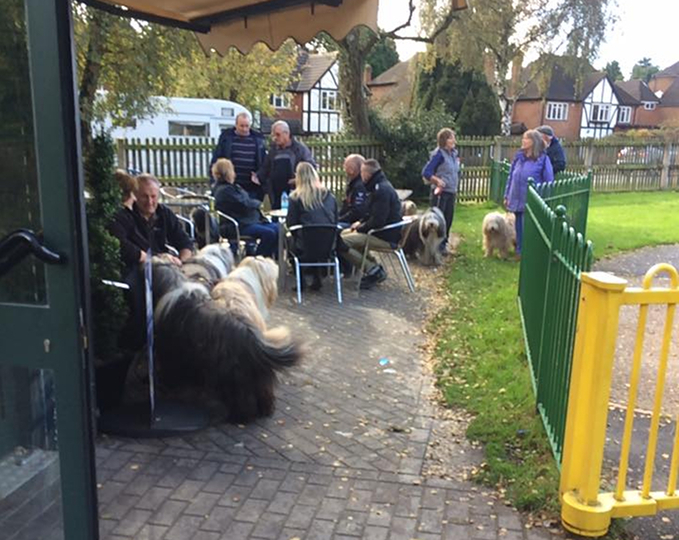 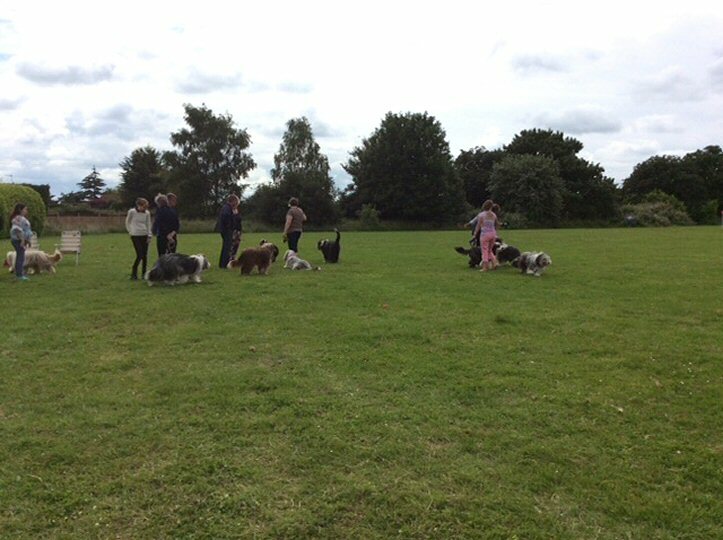 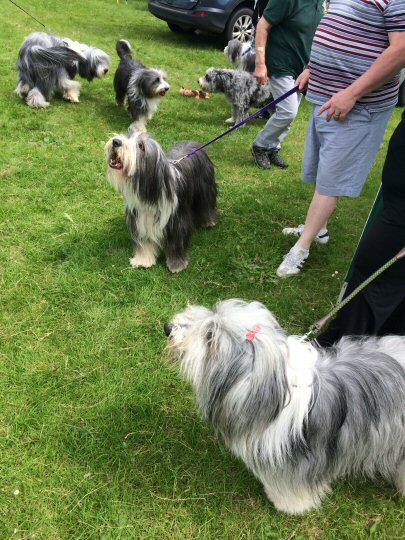 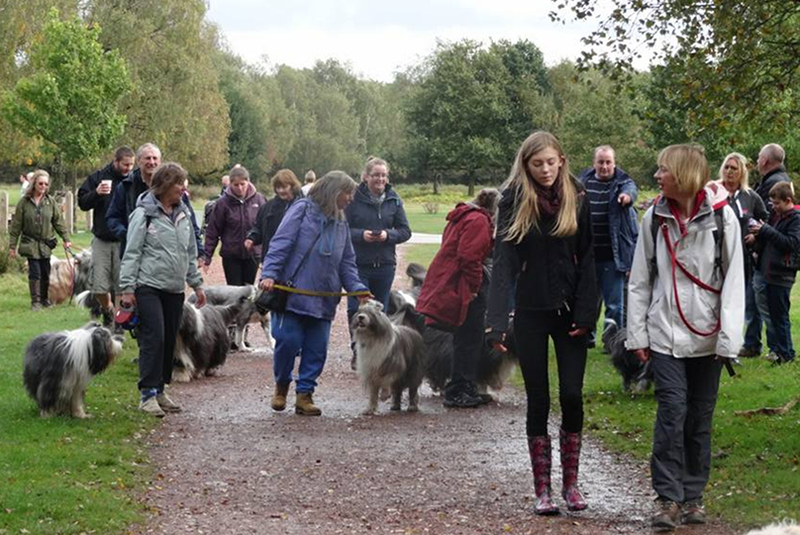 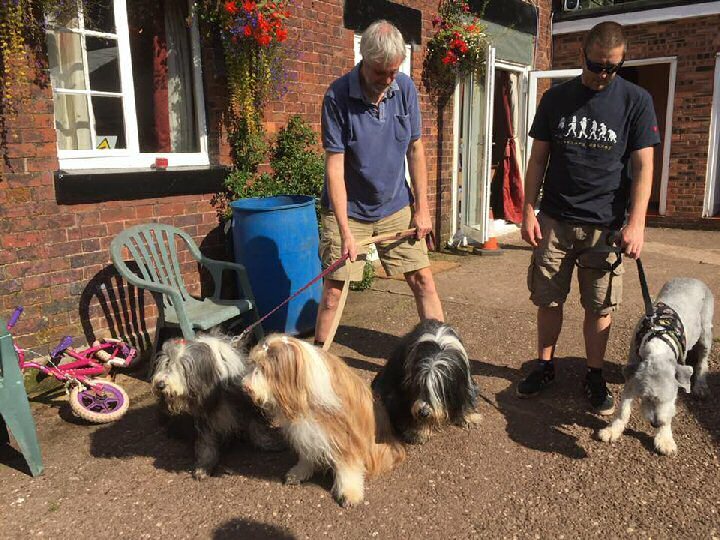 Inkberrow attracts many regulars and it was good to see someof them and some newcomers at our flagship event in the lush Worcestershire countryside. 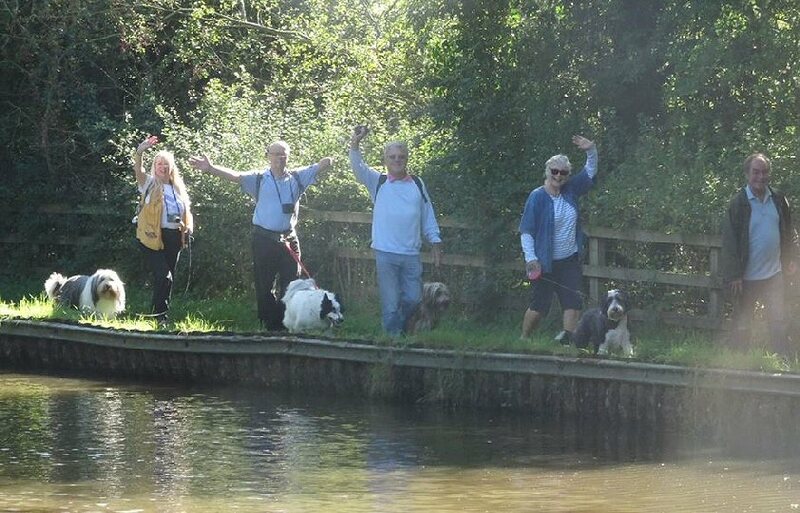 The weather remained fine and a good time was had by all. 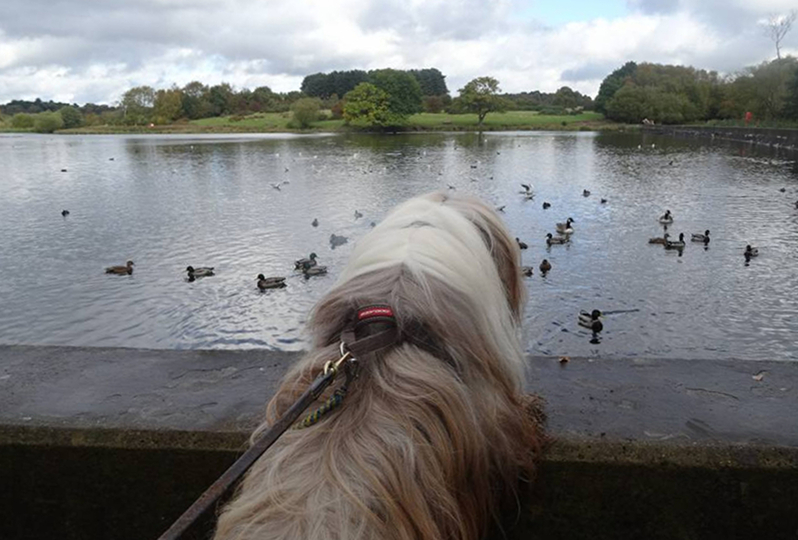 Perfect weather for walking with Beardies! 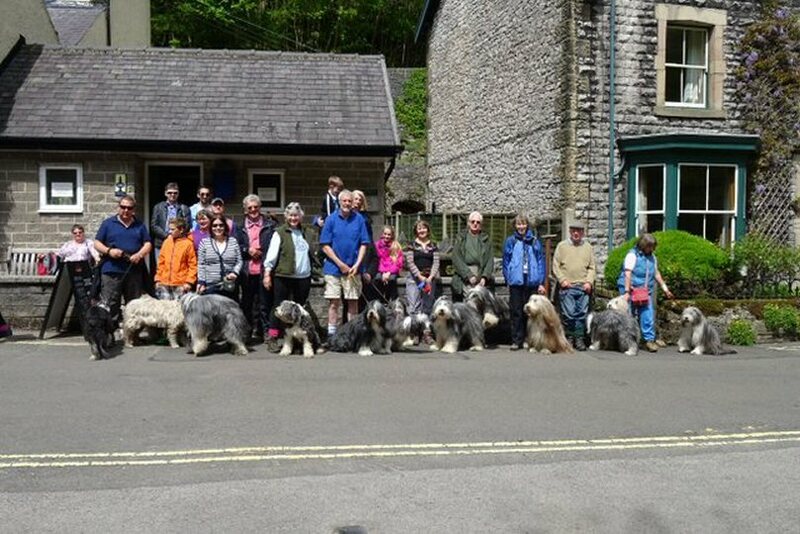 This venue proved yet again that it could draw a respectable number of members and their Beardies for a ramble in good company and wonderful scenery. 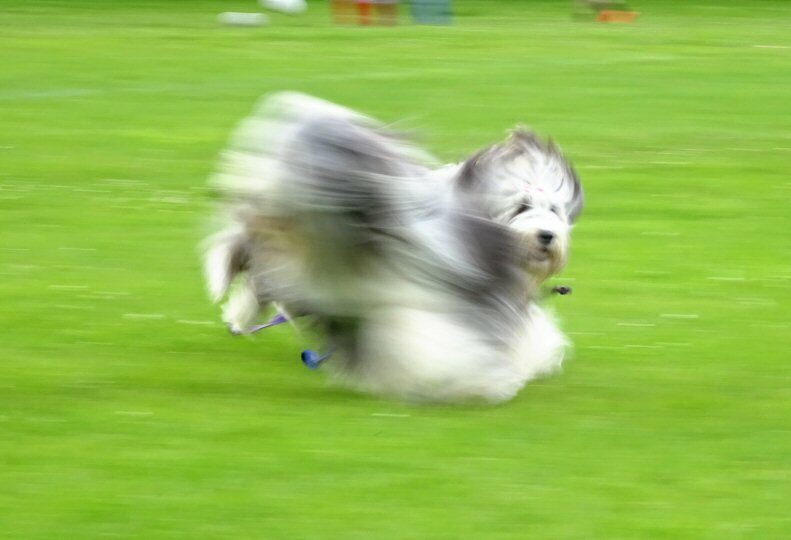 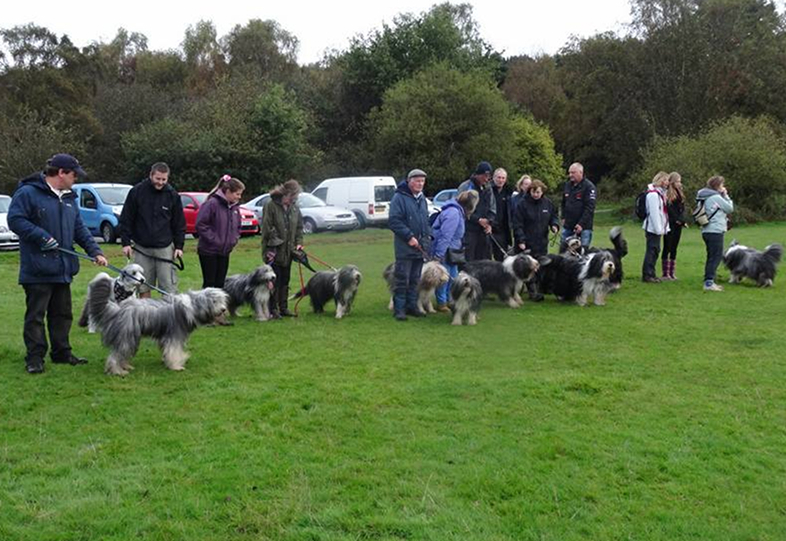 Thanks to all who made the day such a success, and to Chris Bennett for supplying these super photographs. 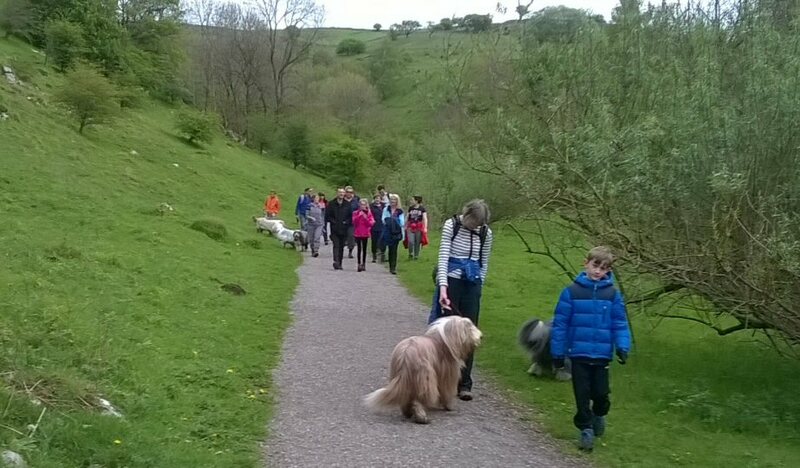 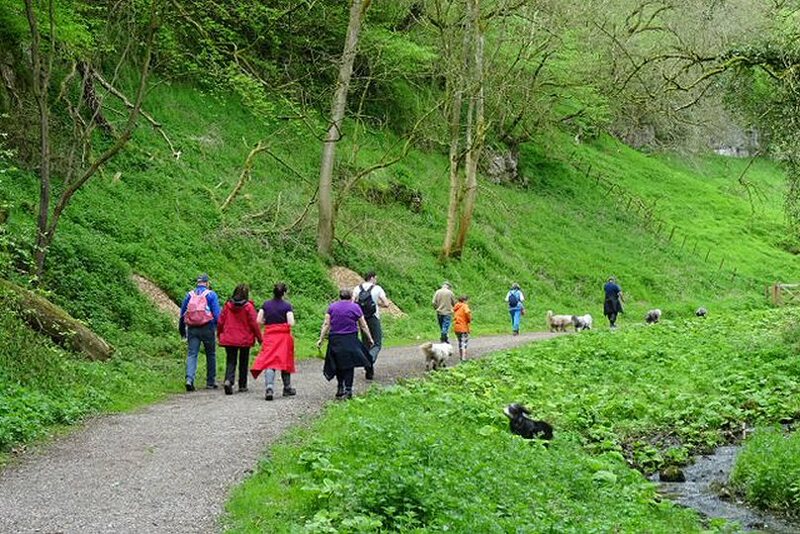 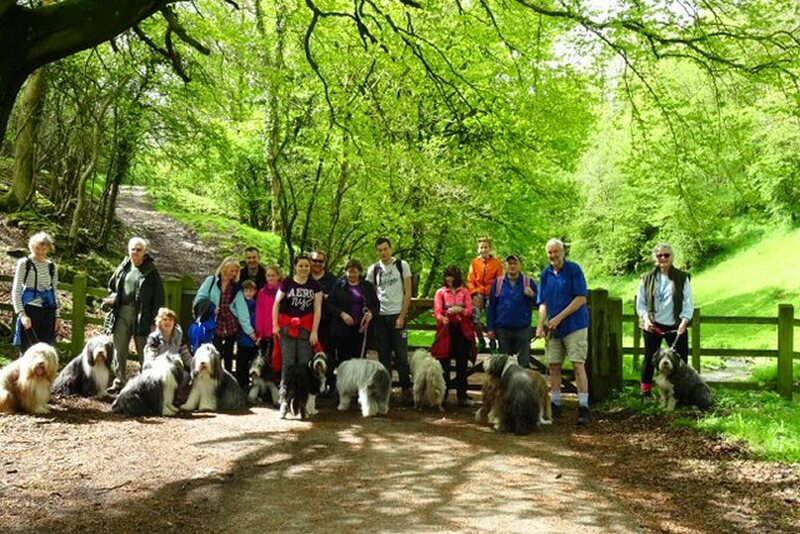 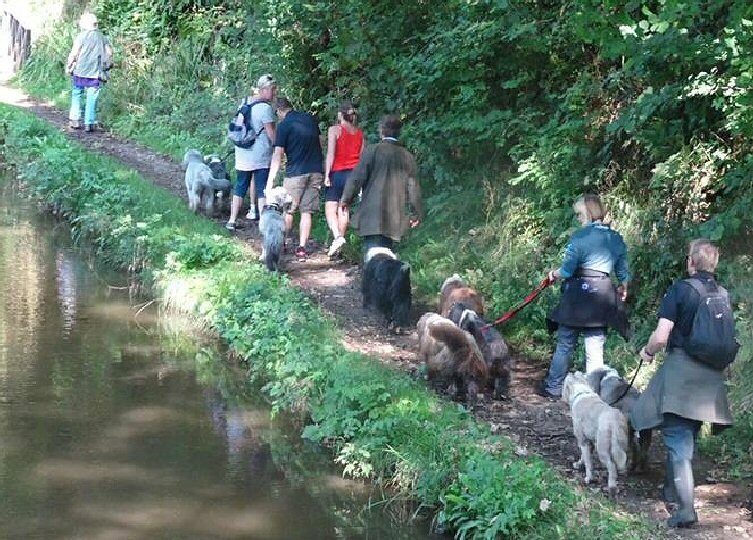 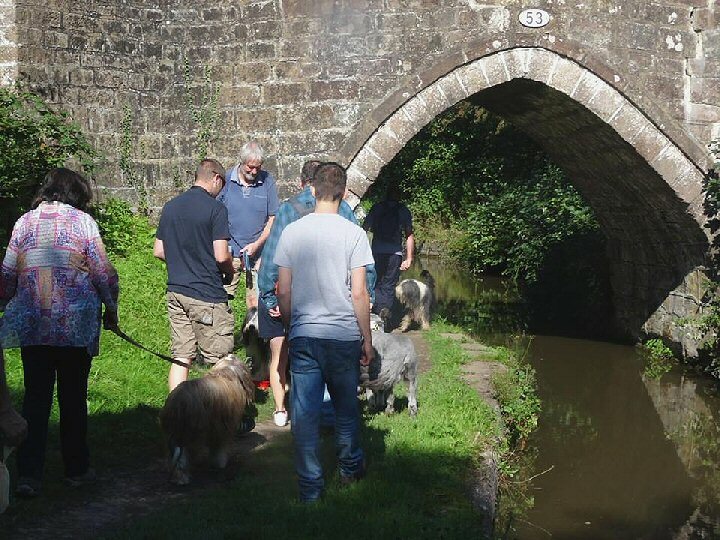 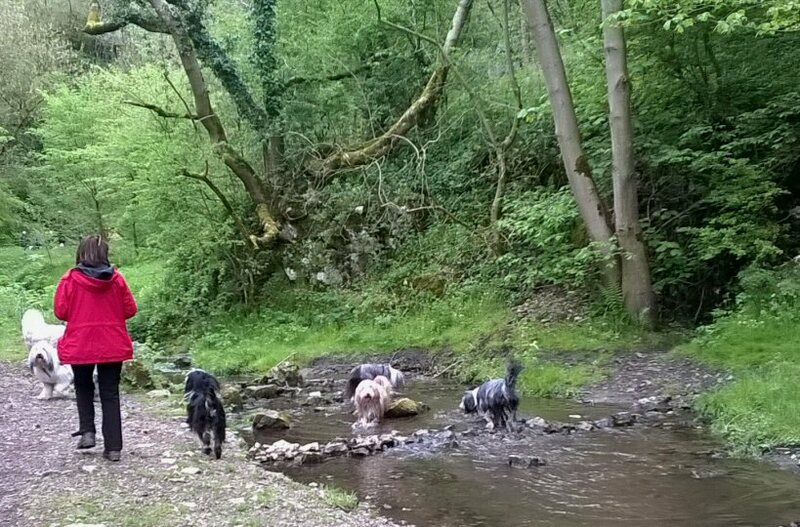 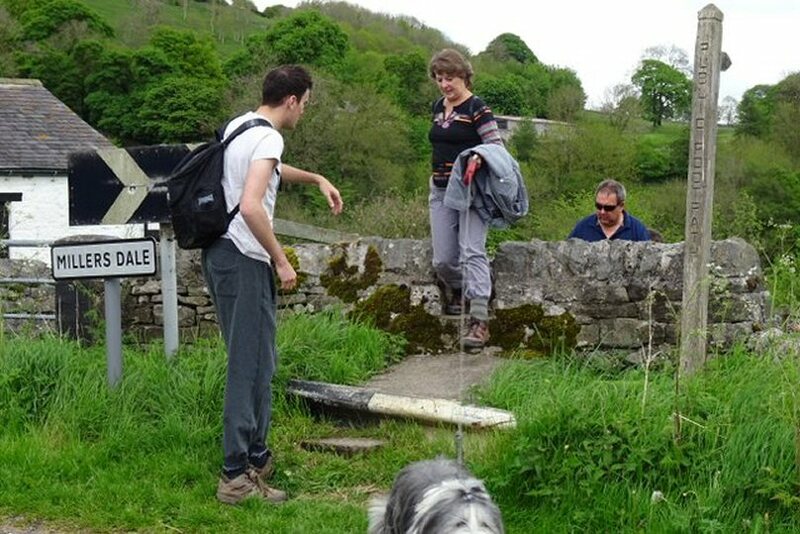 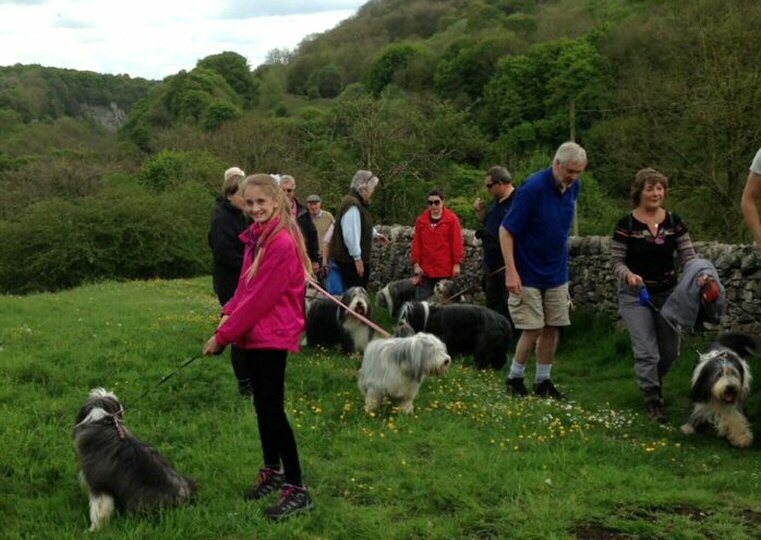 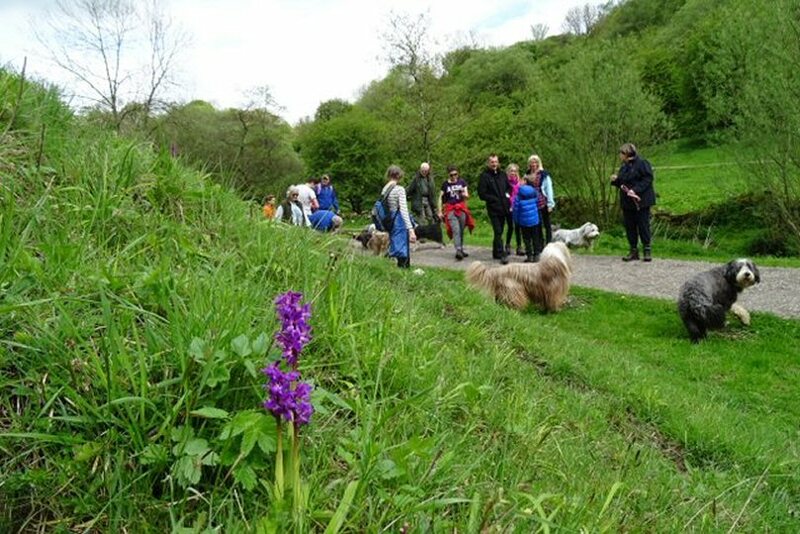 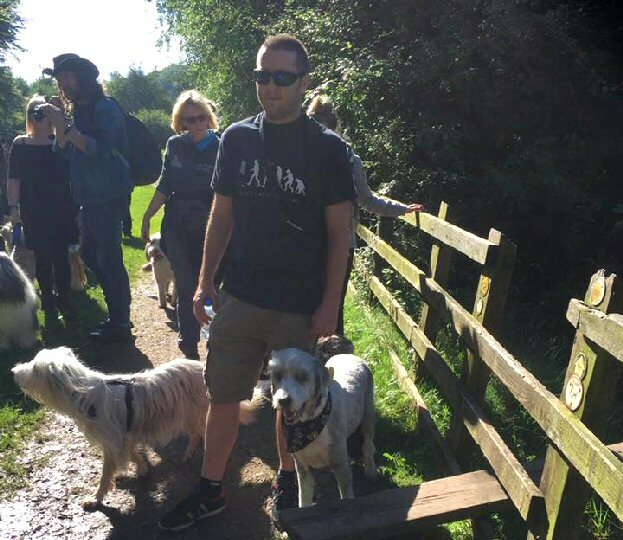 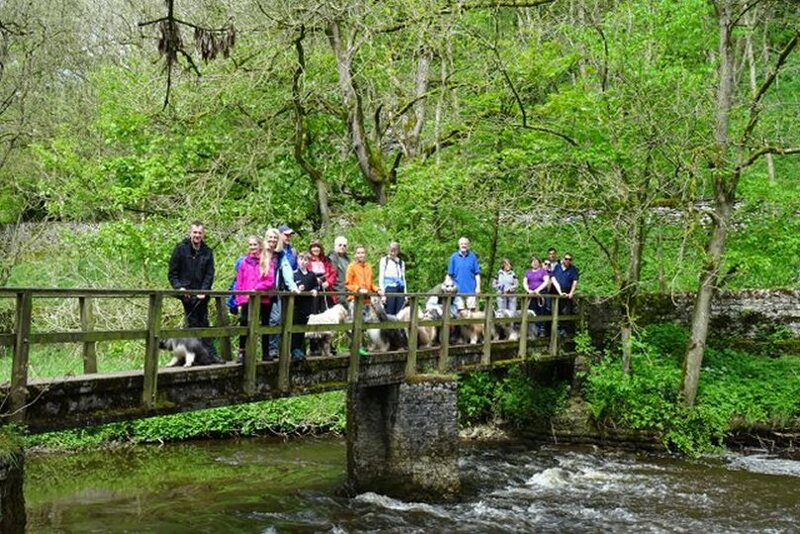 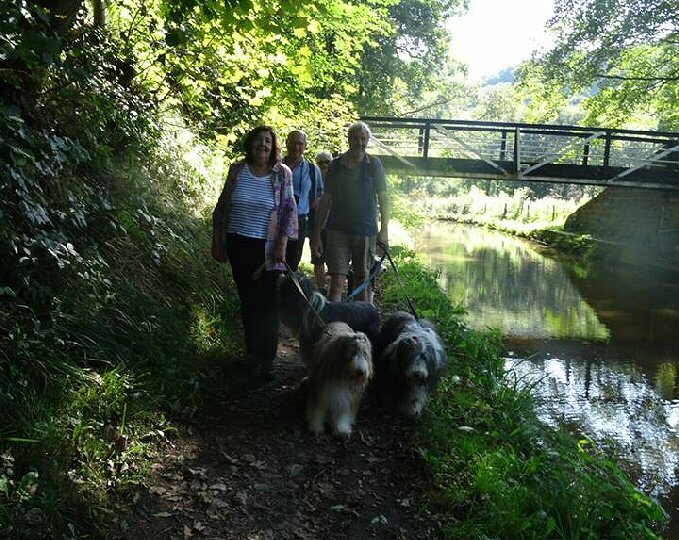 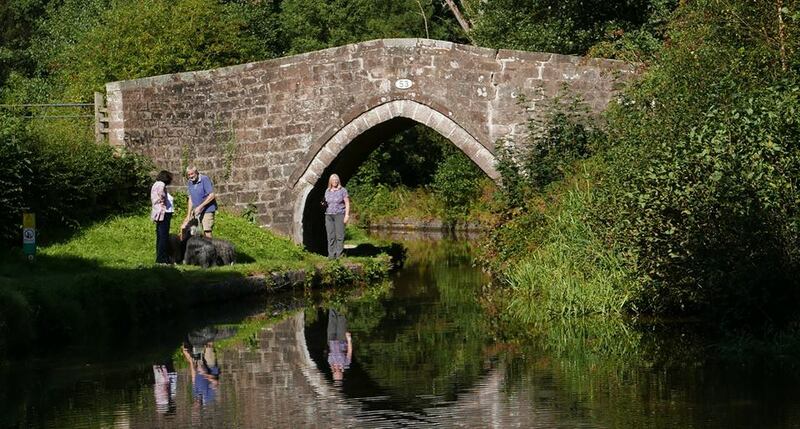 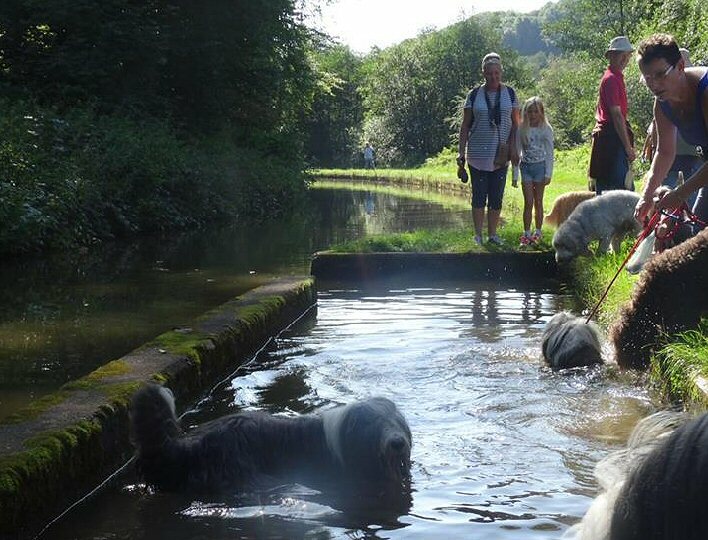 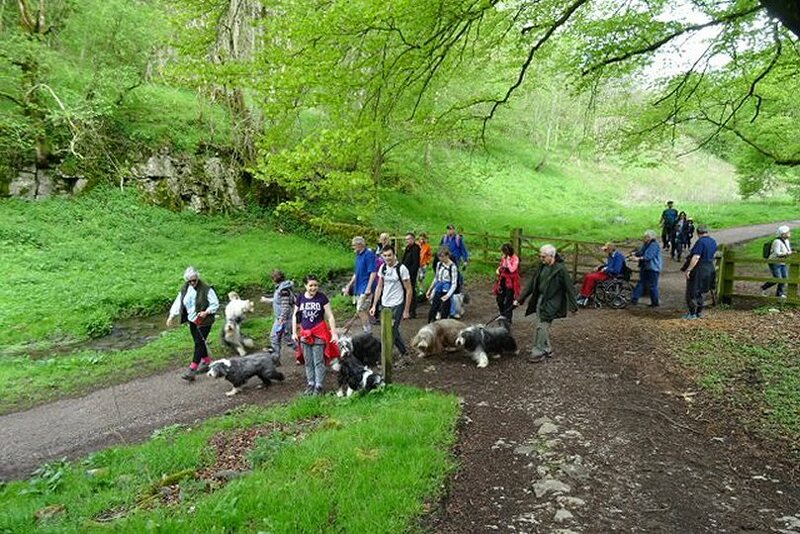 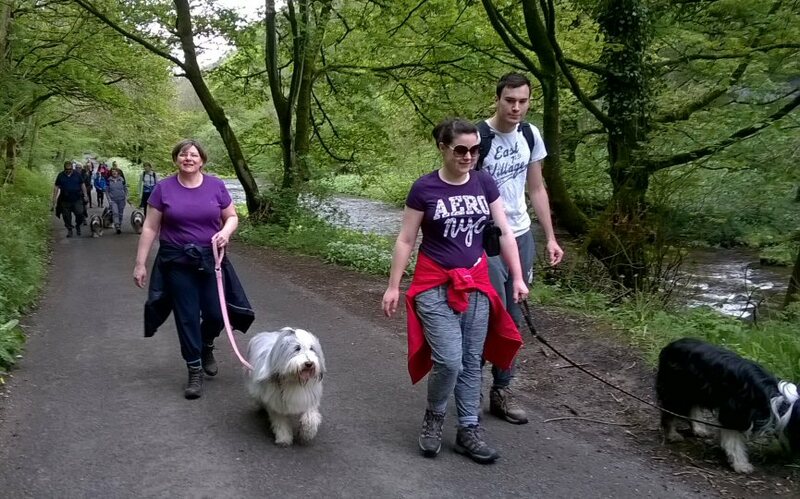 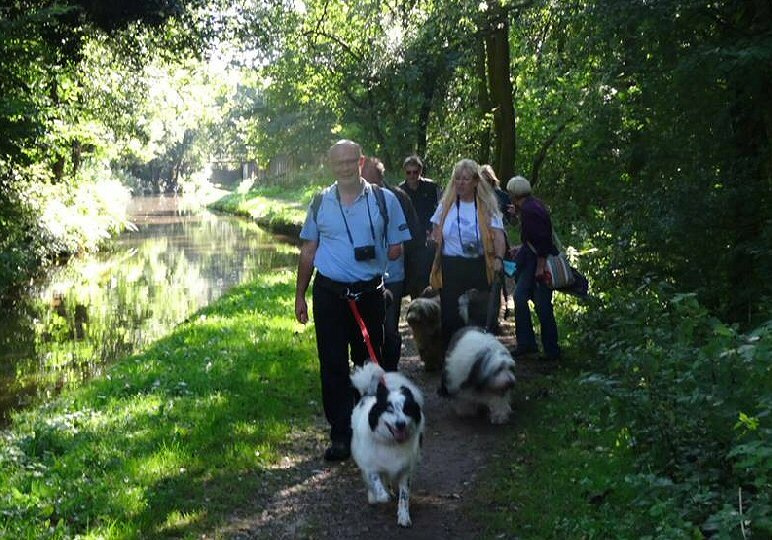 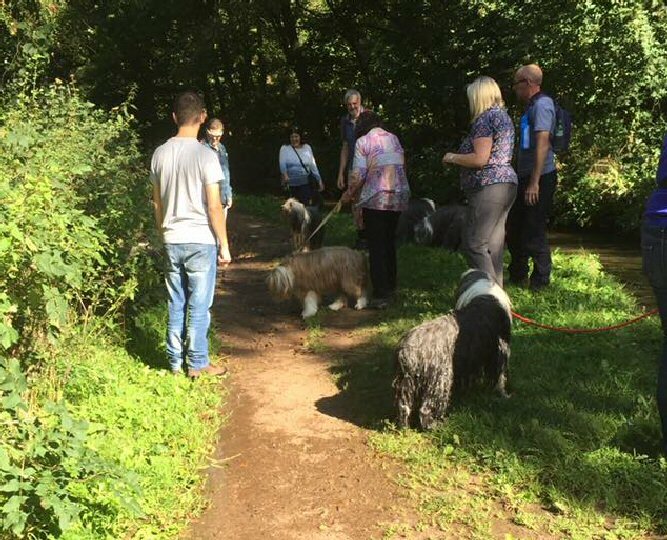 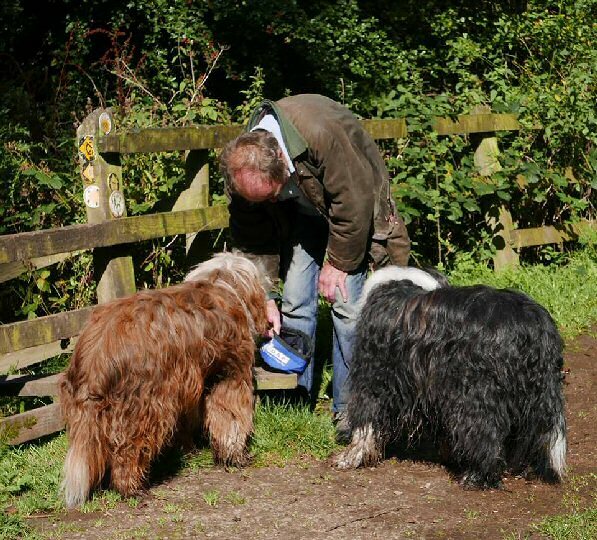 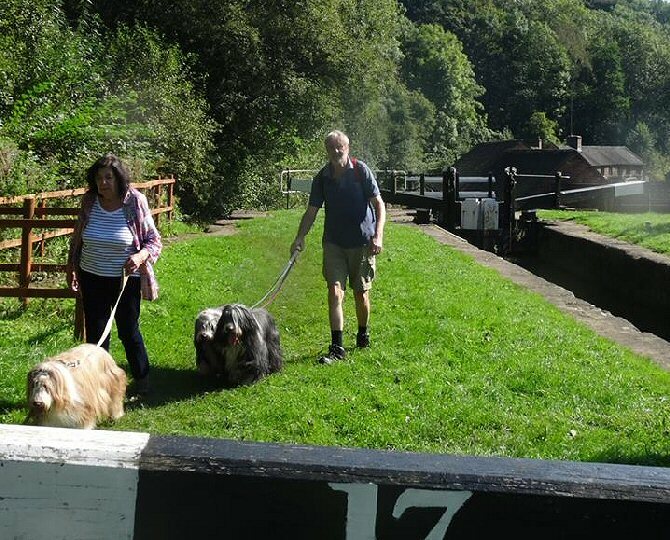 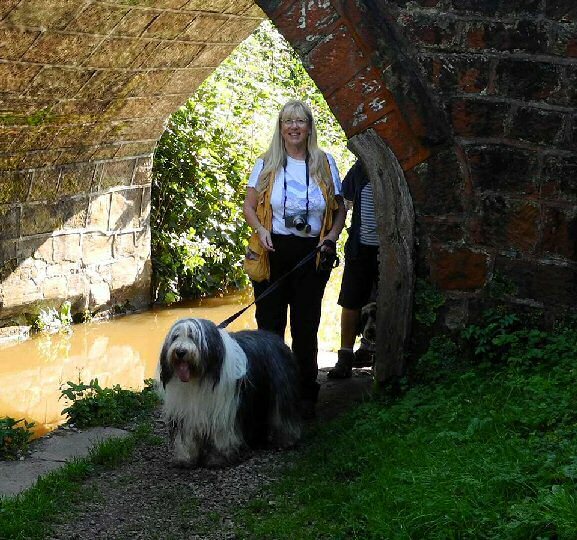 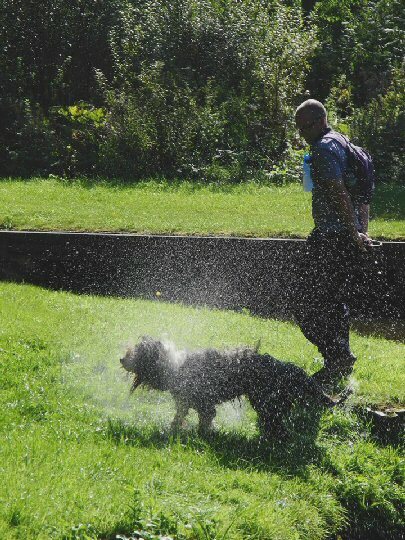 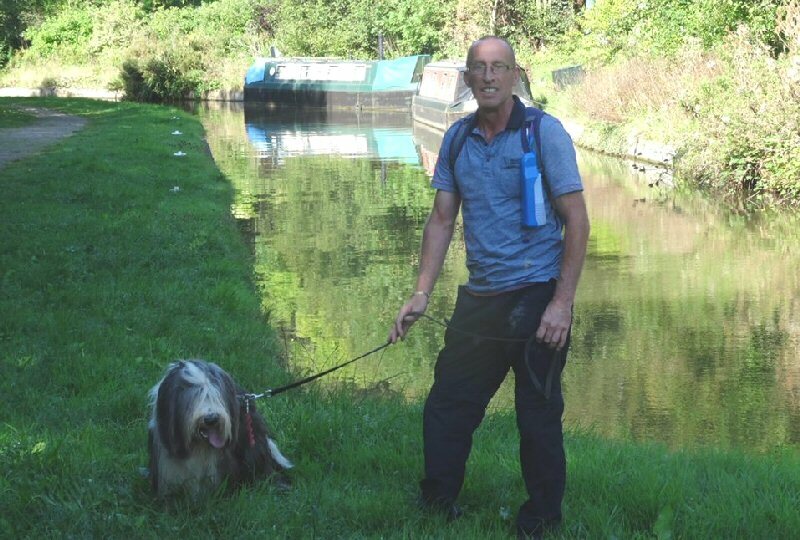 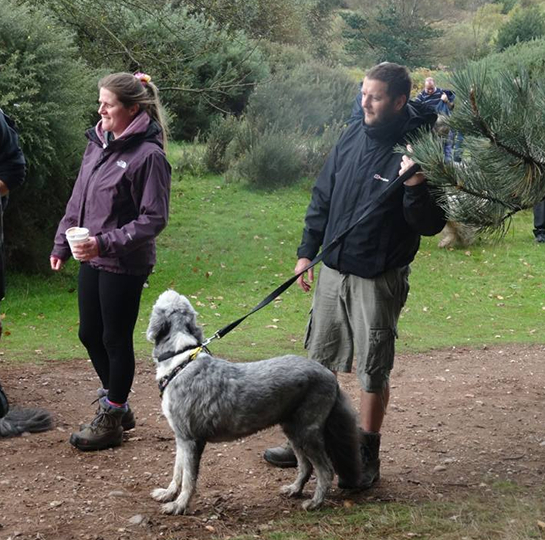 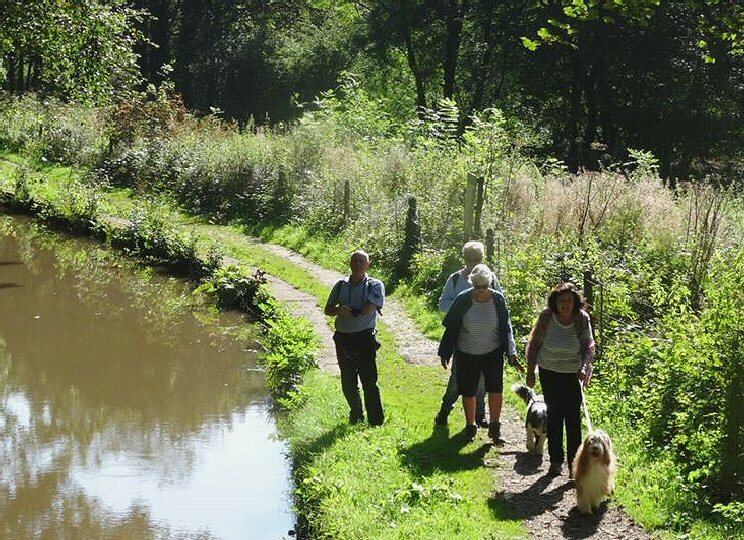 We extended an invitation to members of Northern Branch to the Churnet Valley Ramble, as it takes place close to their own area. 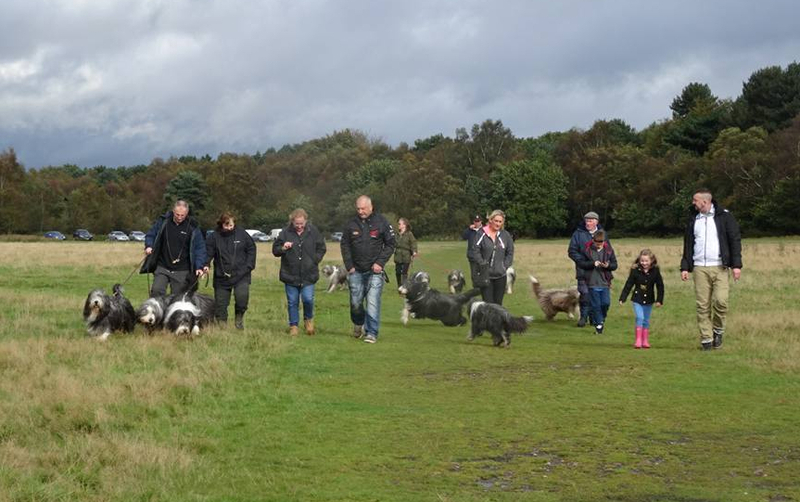 This proved to be an inspired gesture and as many Northern members as Midland members came on the day. 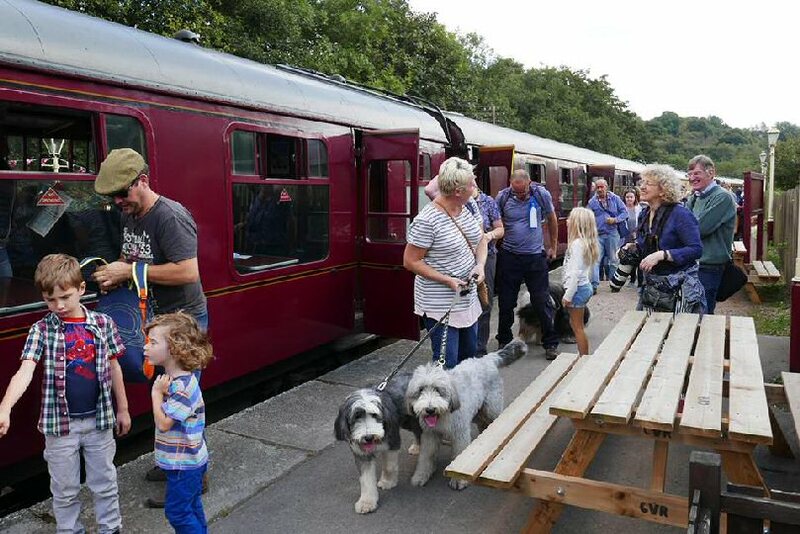 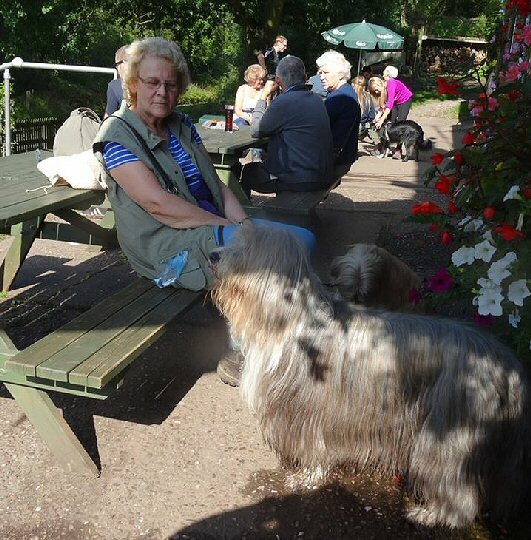 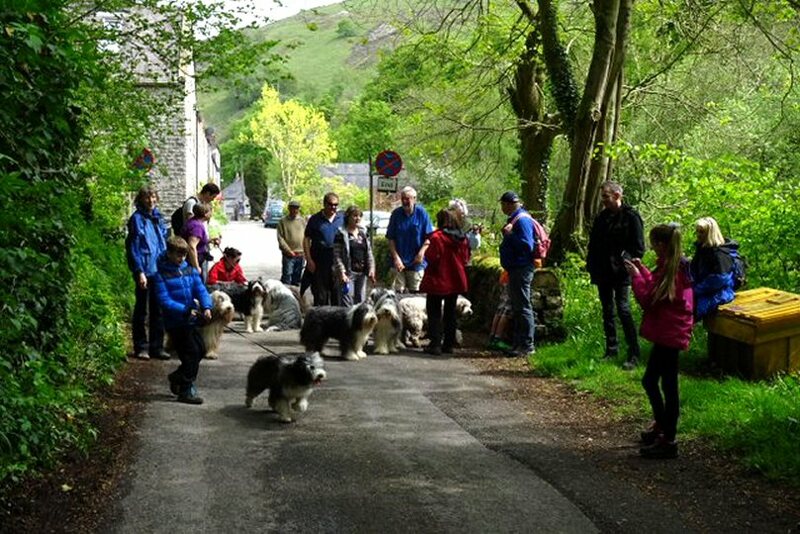 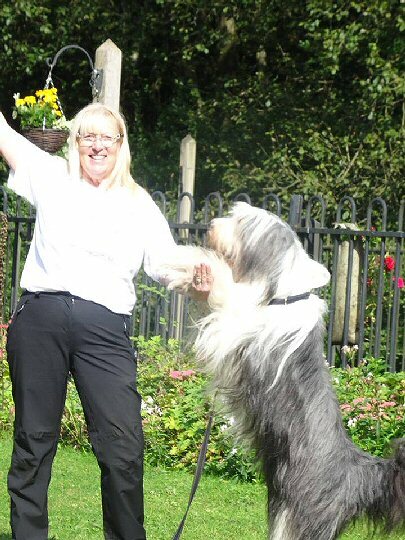 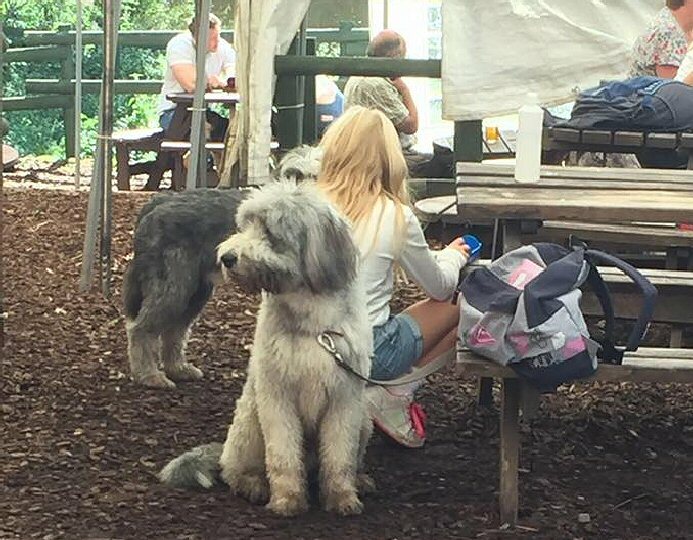 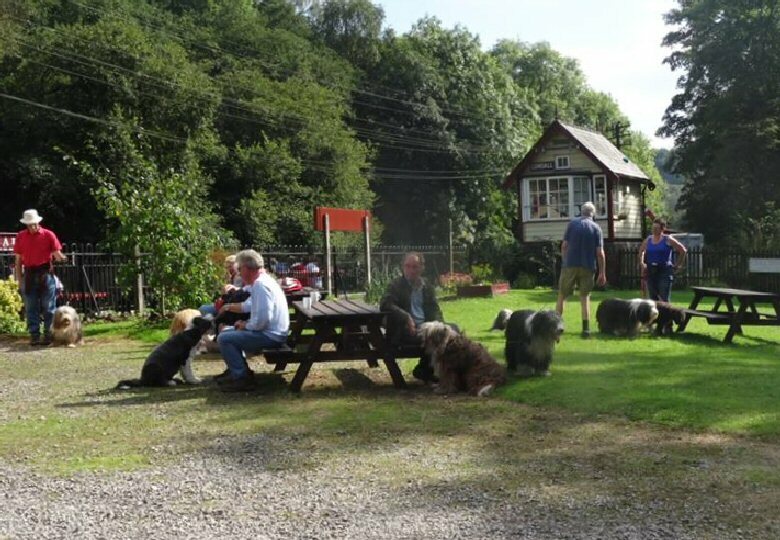 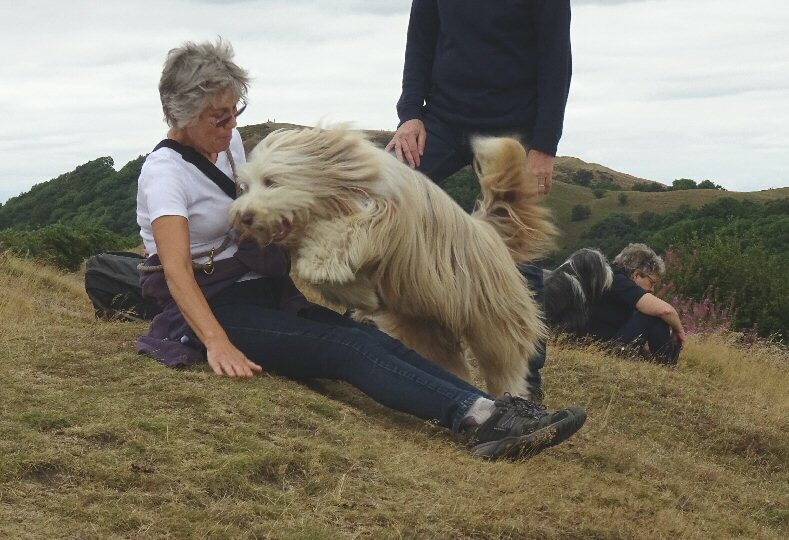 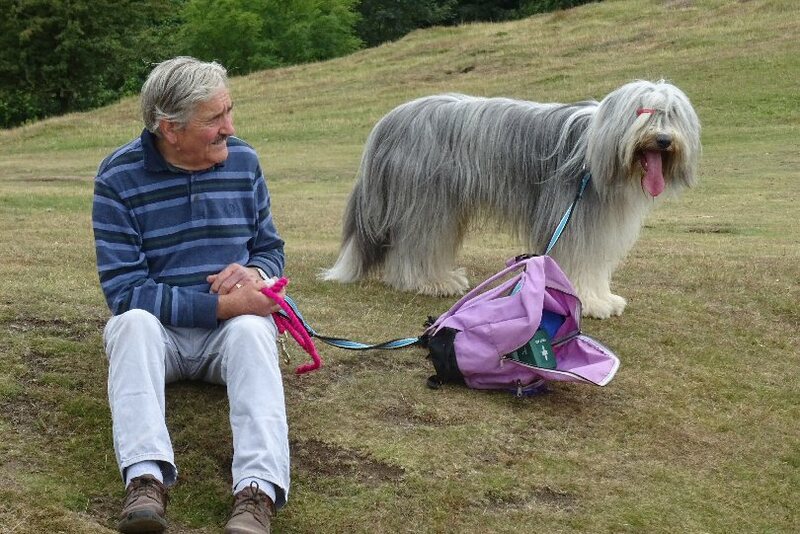 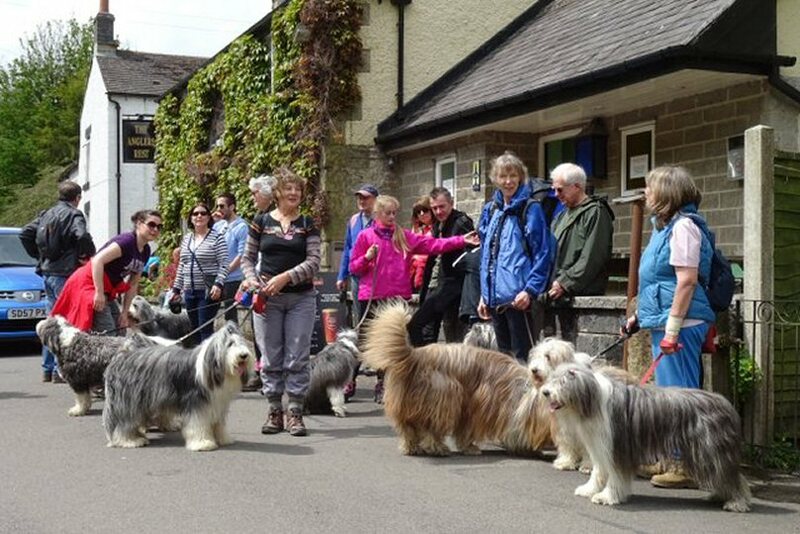 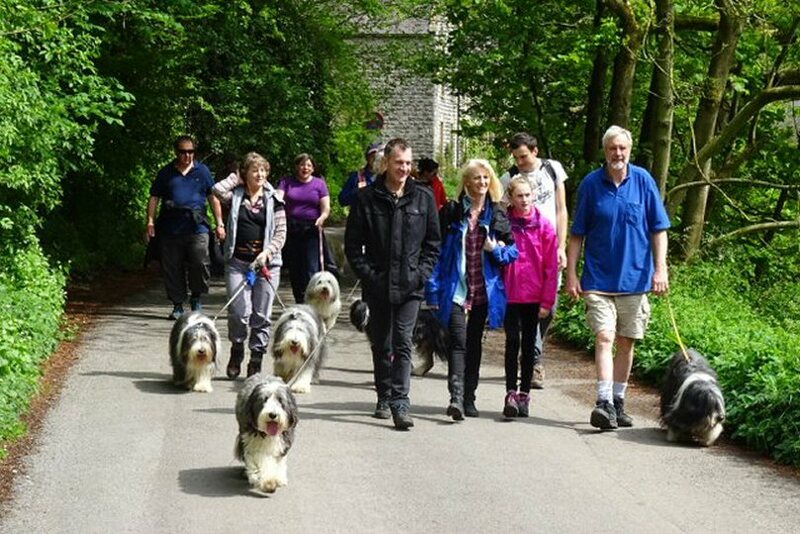 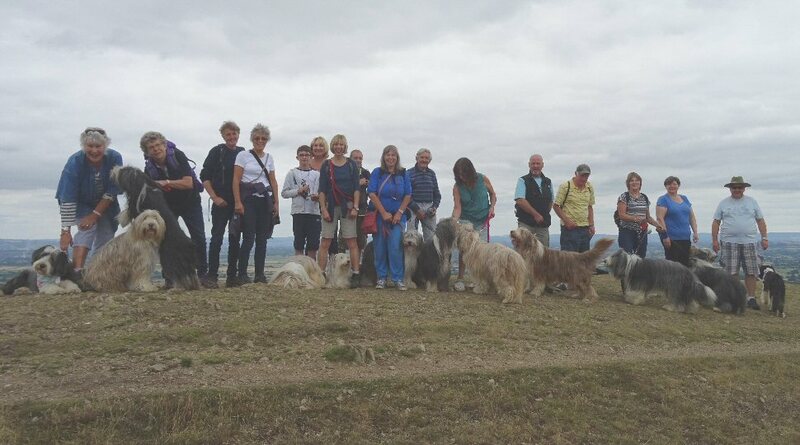 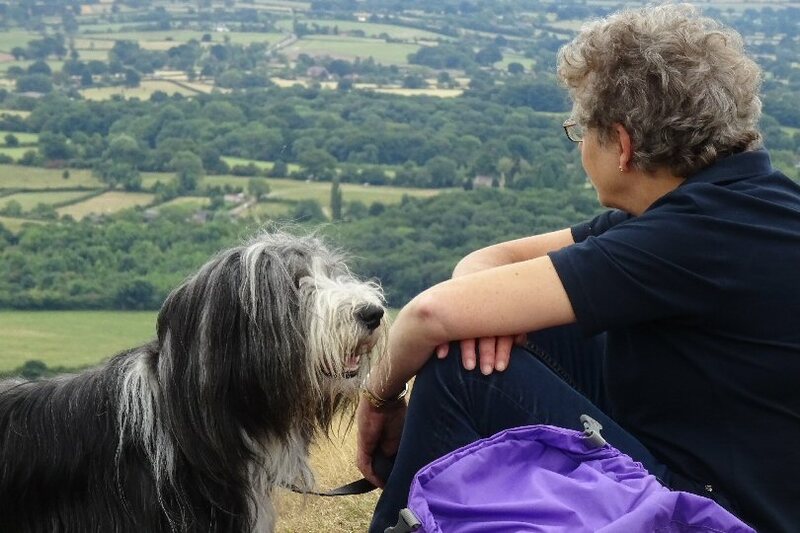 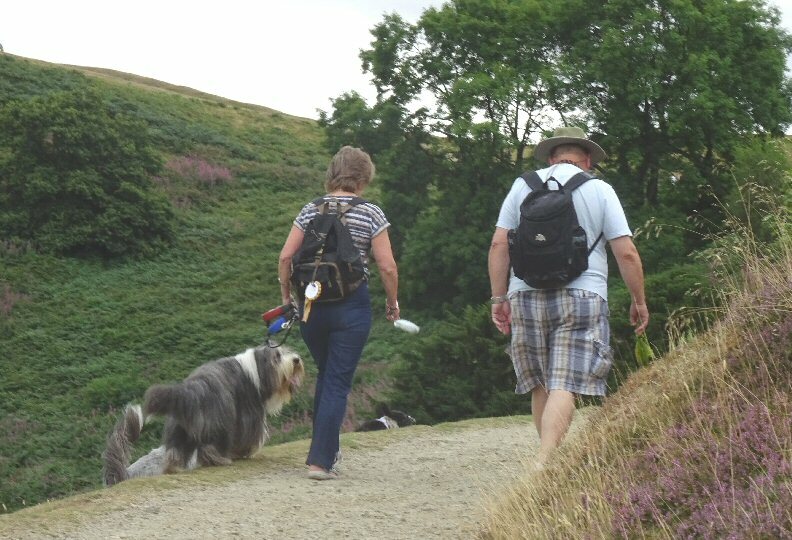 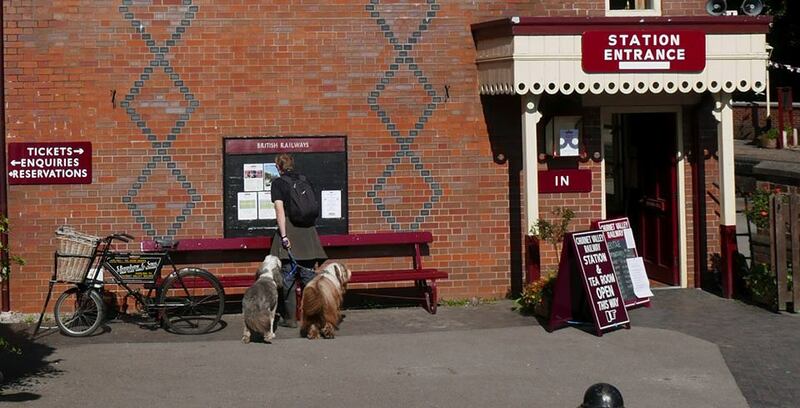 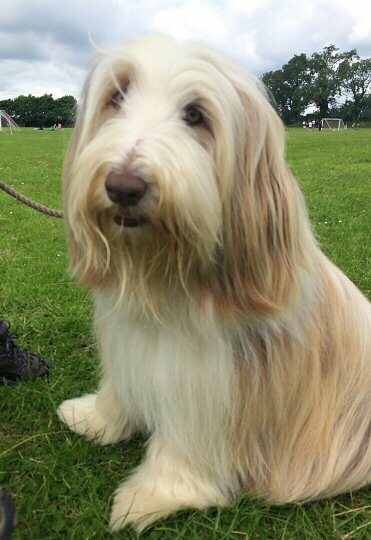 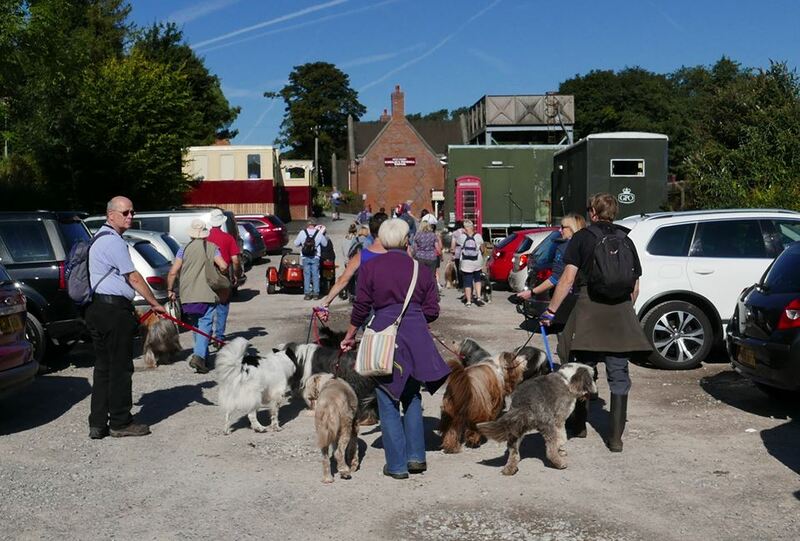 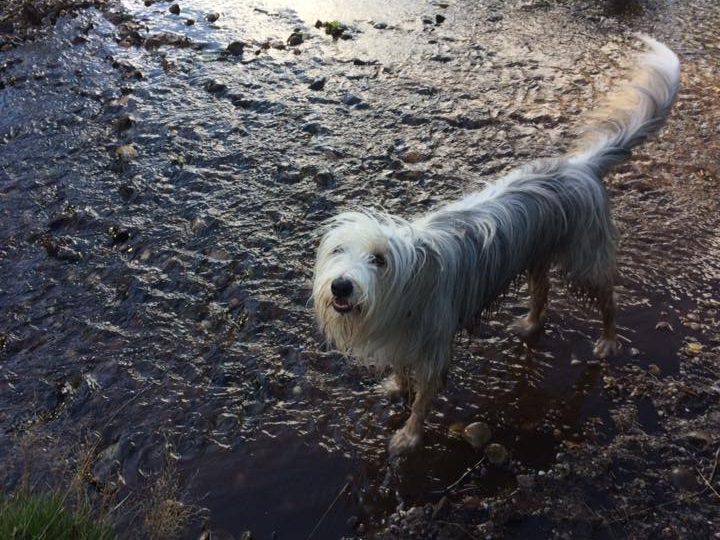 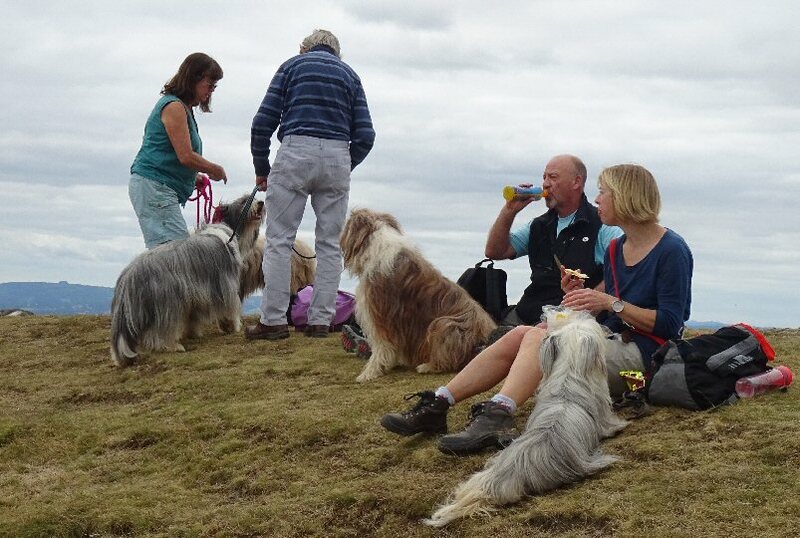 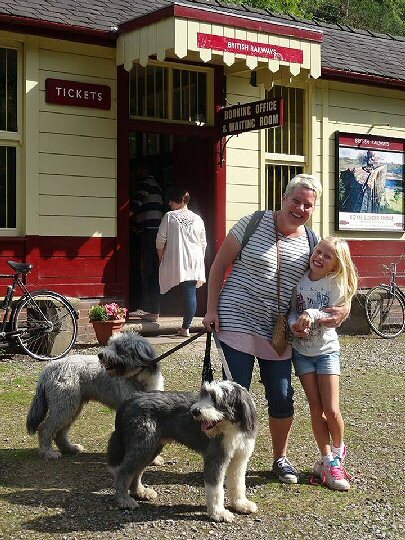 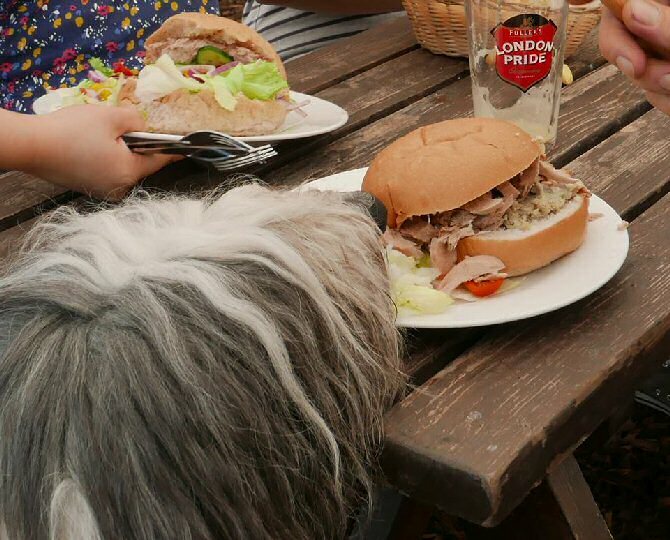 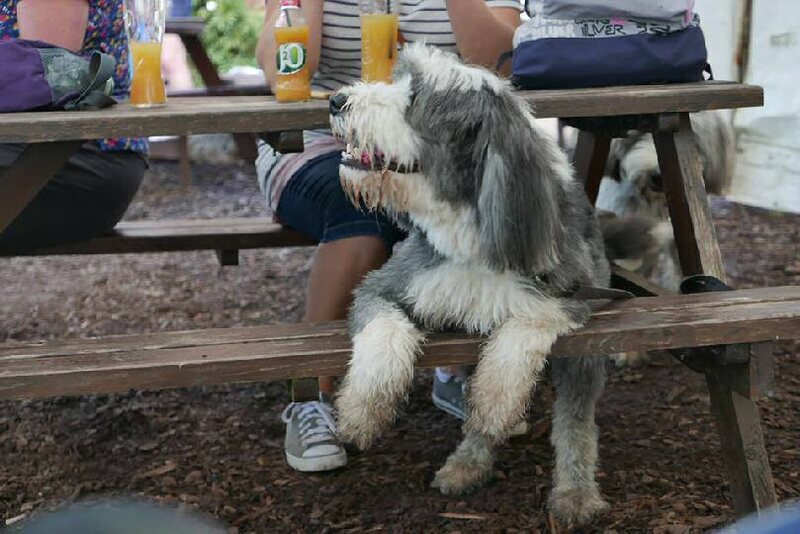 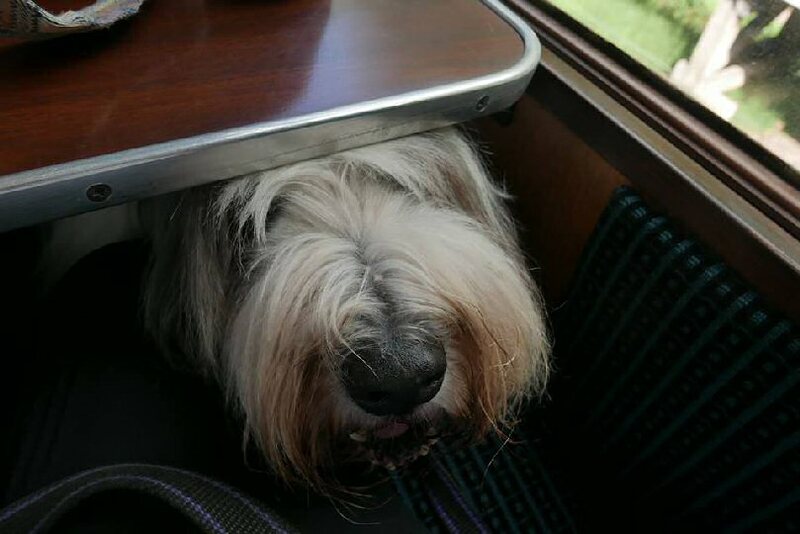 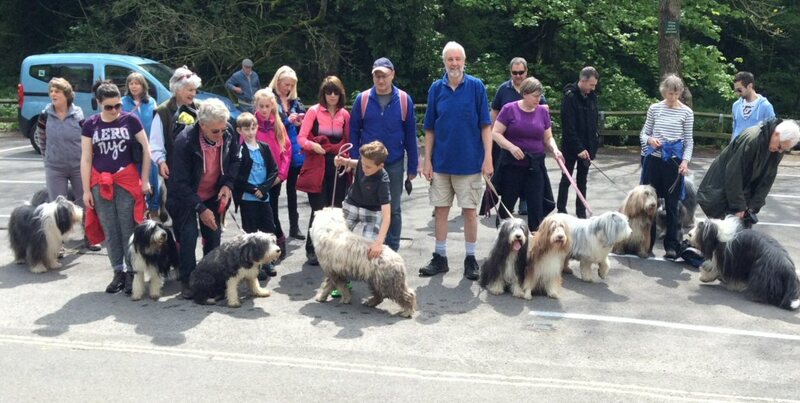 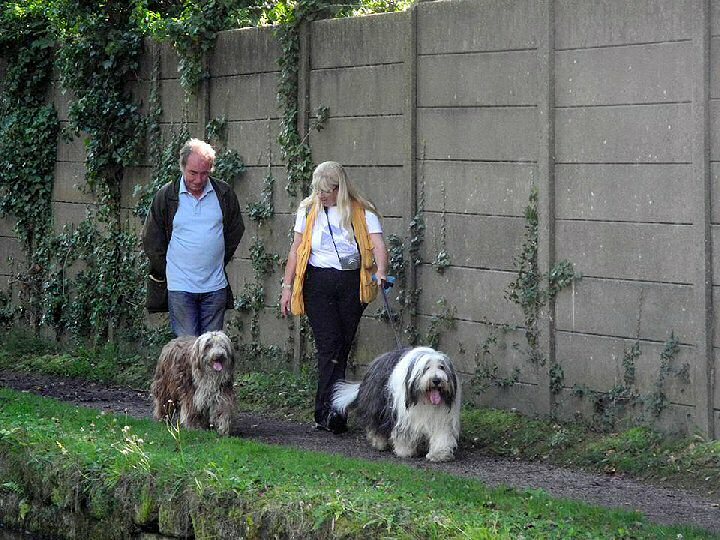 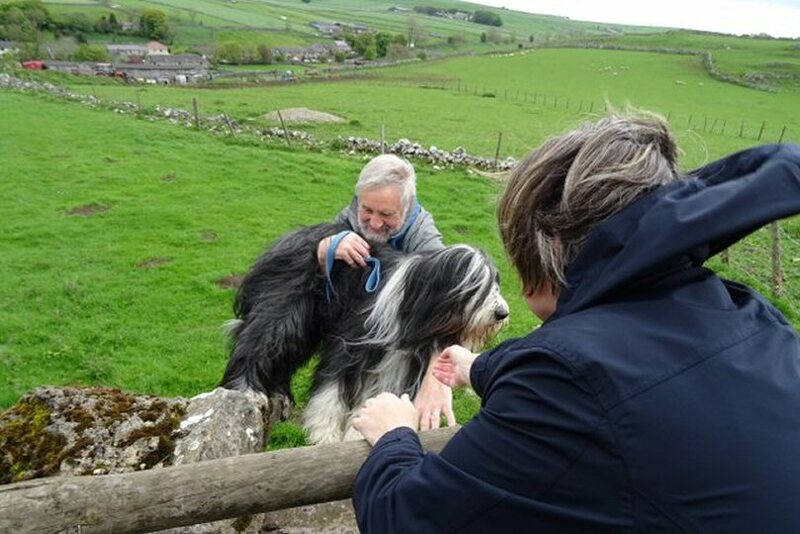 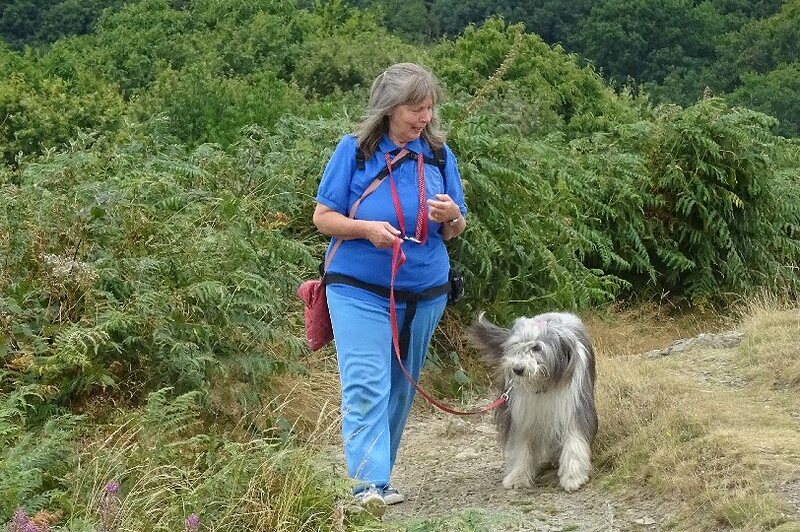 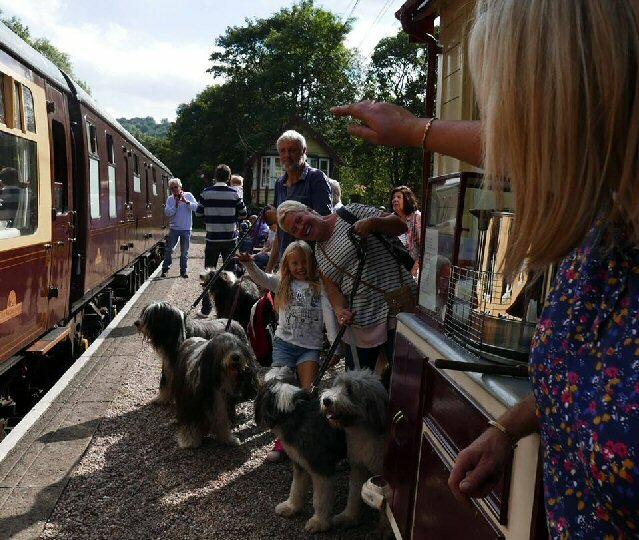 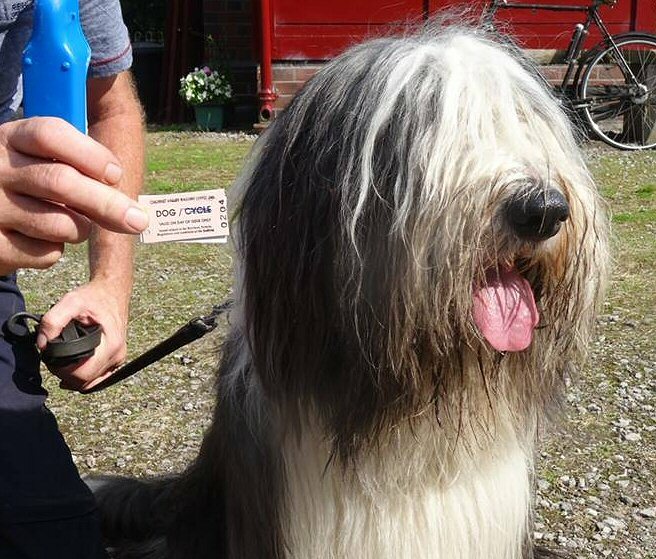 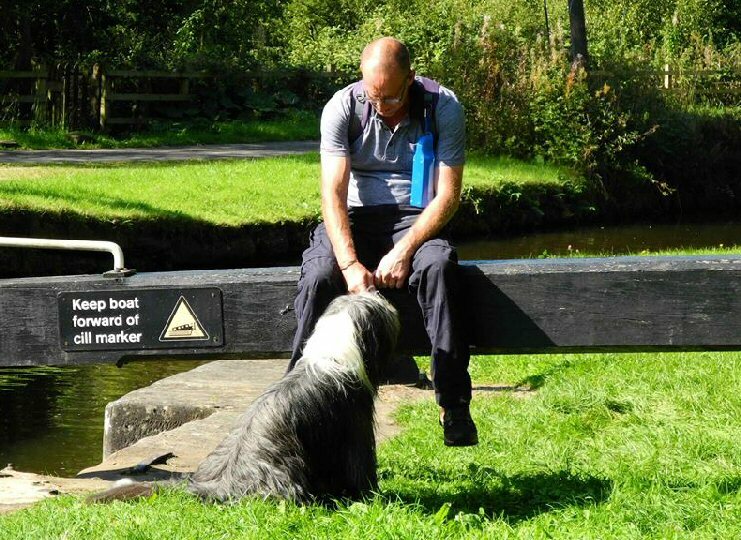 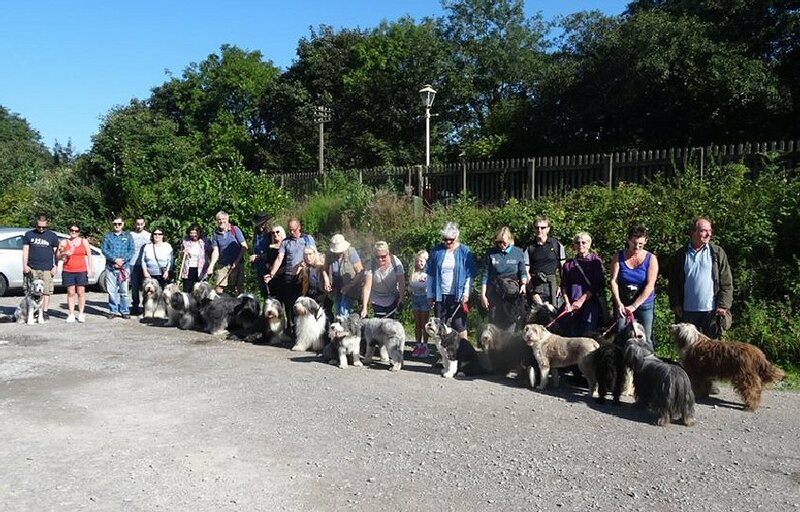 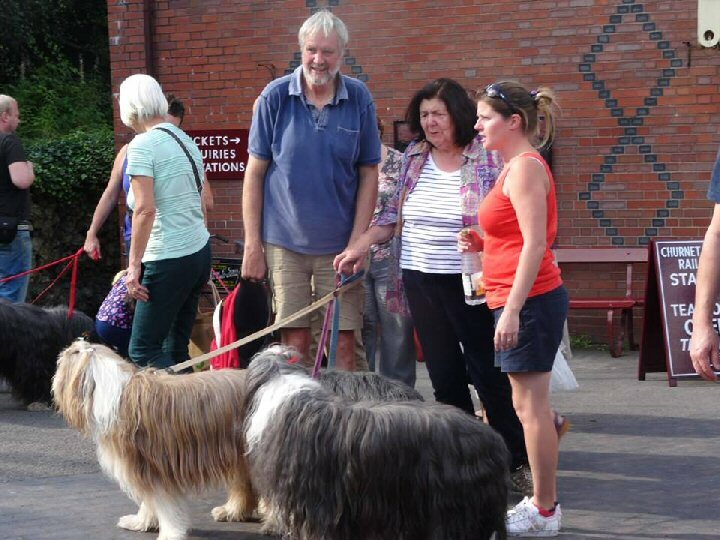 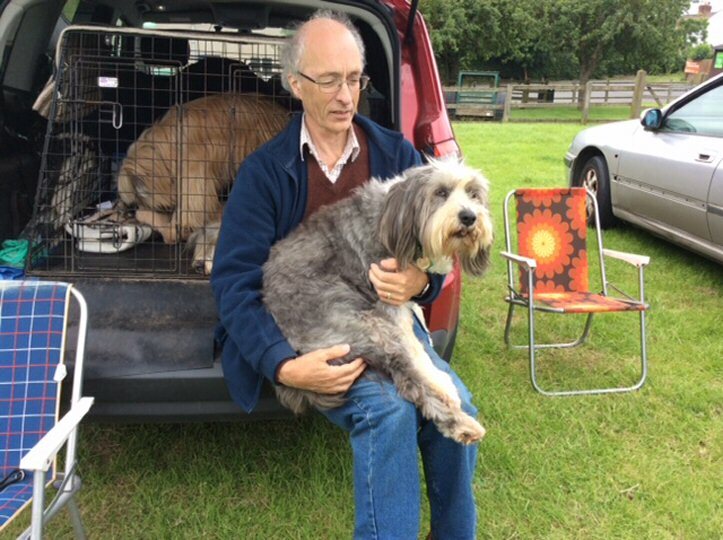 So it was that twenty-two owners and family and twenty-six Beardies walked under beautiful blue skies and enjoyed an al fresco meal at the pub and most opted to return to the start point by train. 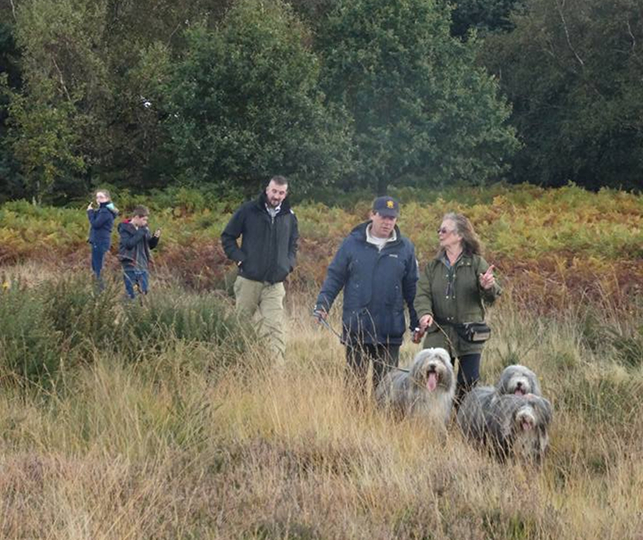 All in all an extremely enjoyable day with excellent friendly company. 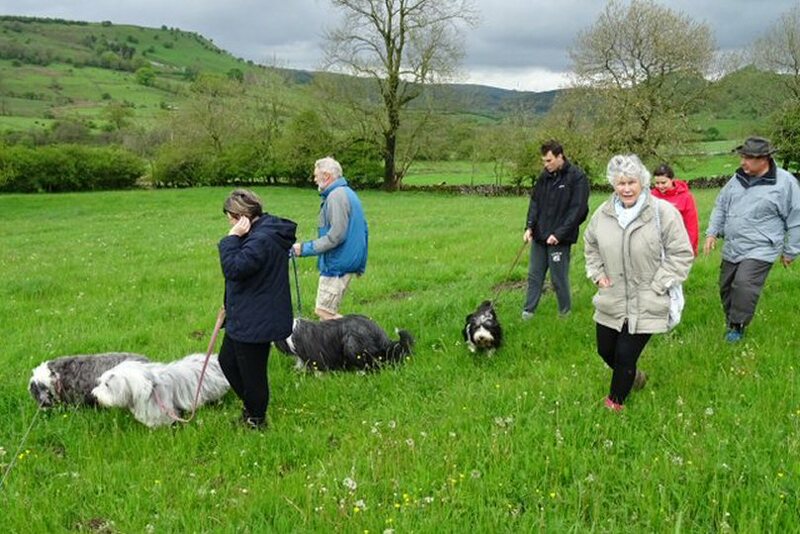 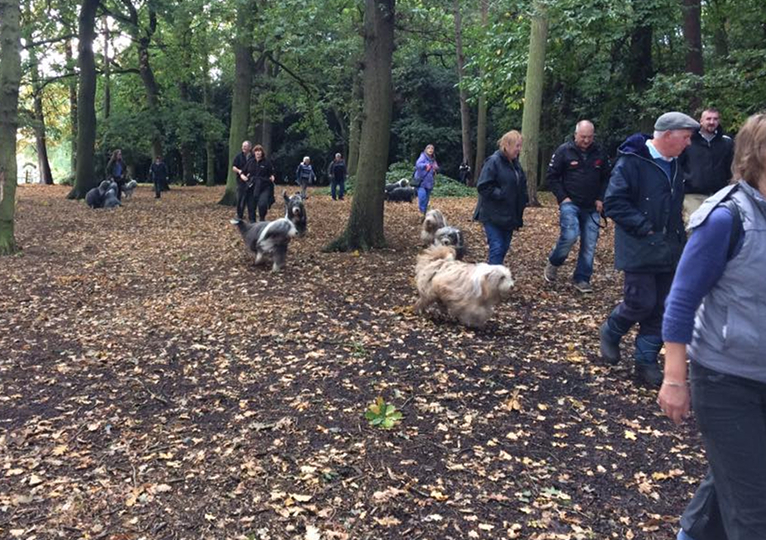 This was a new venue for a Branch ramble - at least in the last twenty years. 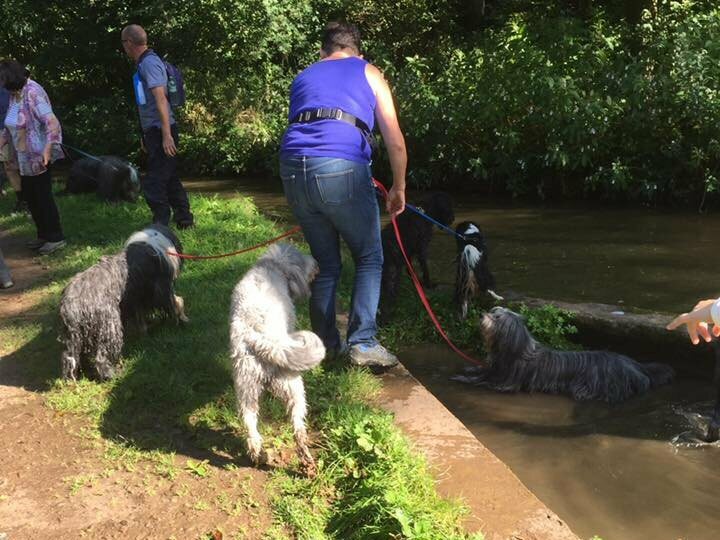 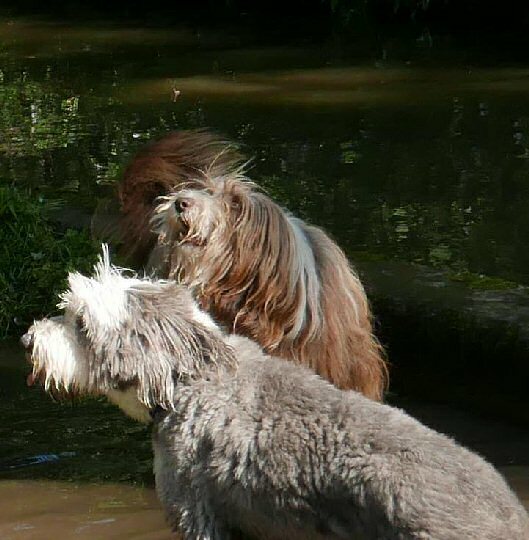 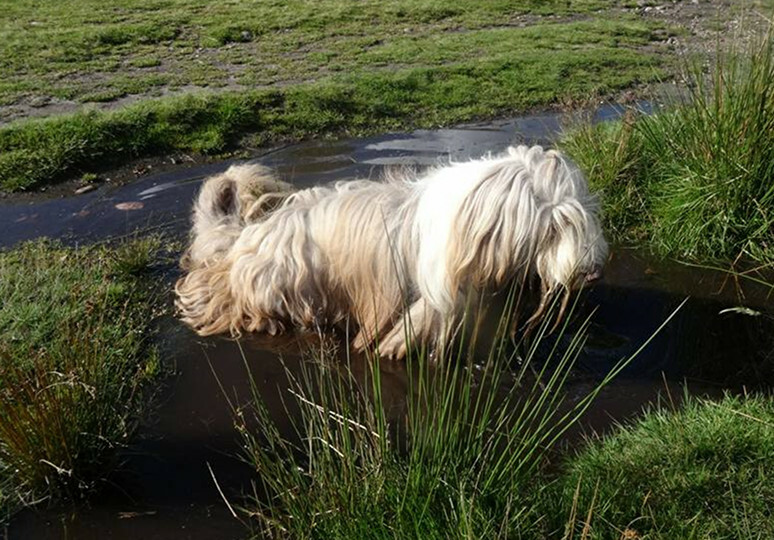 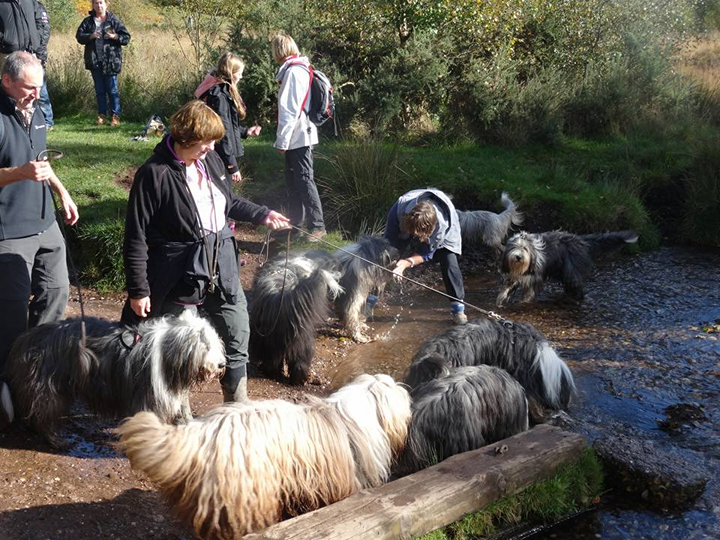 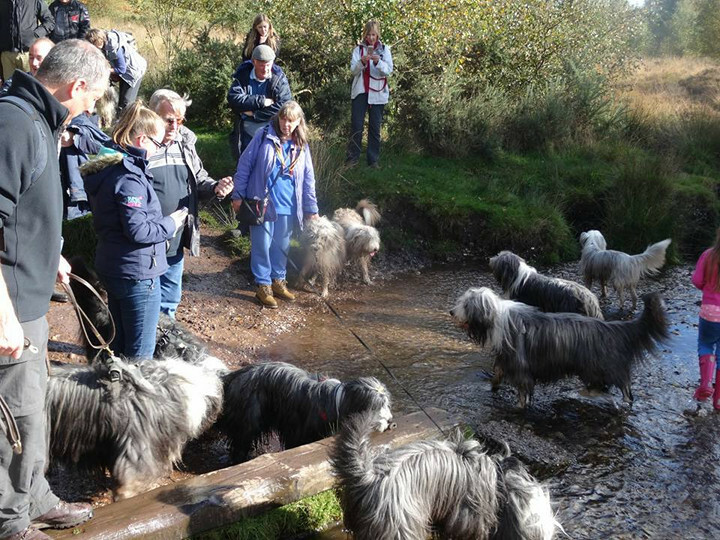 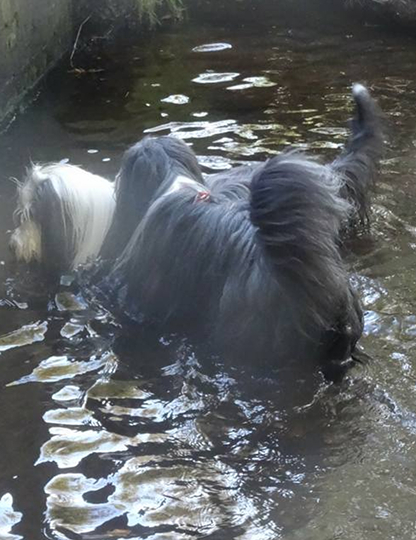 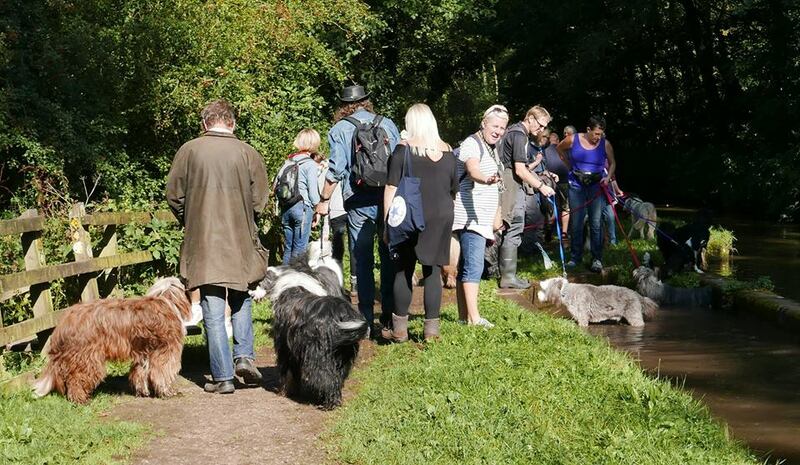 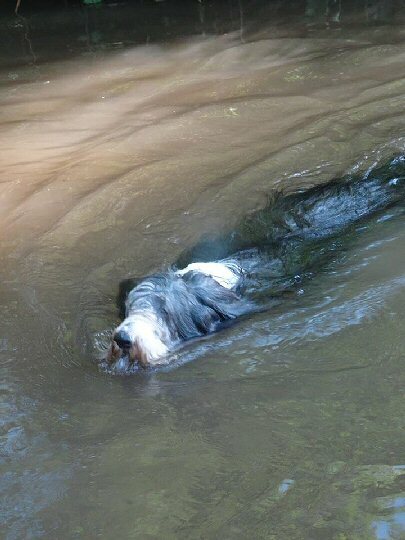 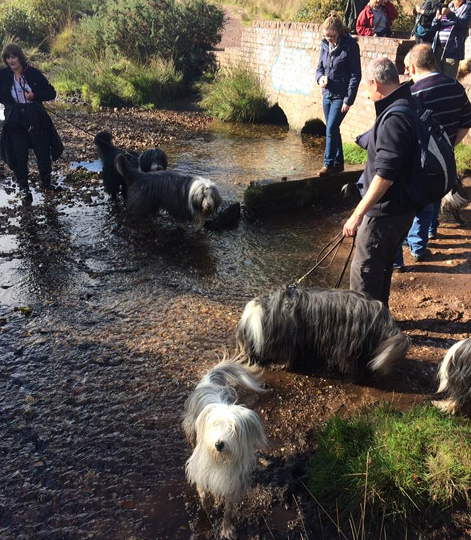 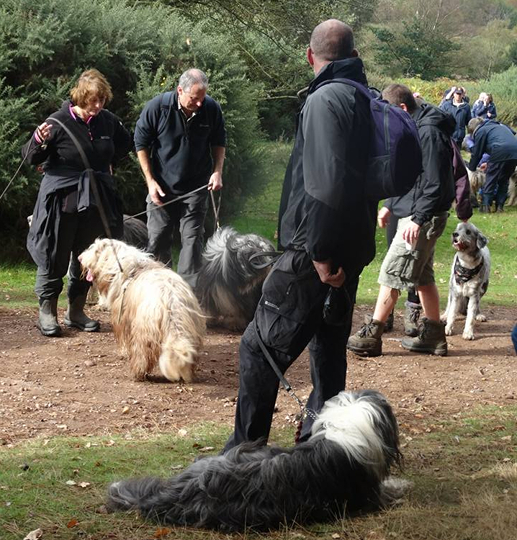 The weather held for the day and a good turnout ensured a very sociable ramble with plenty of opportunity for Beardies to paddle and run free. 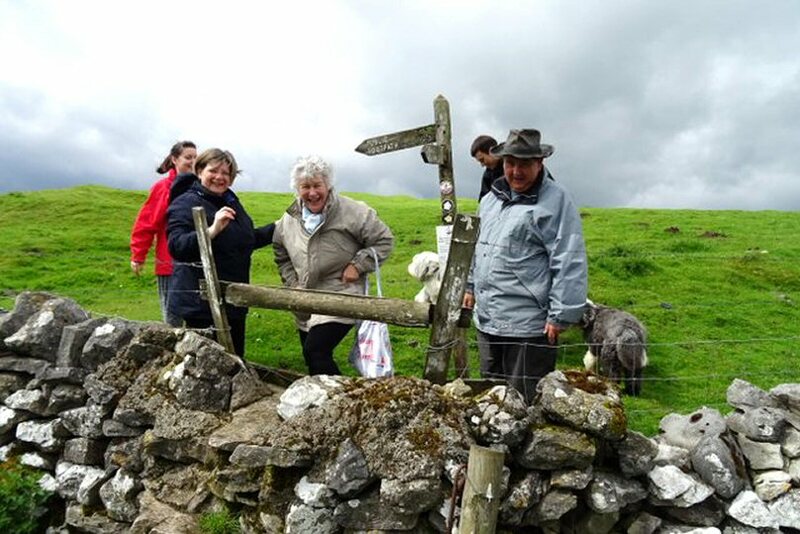 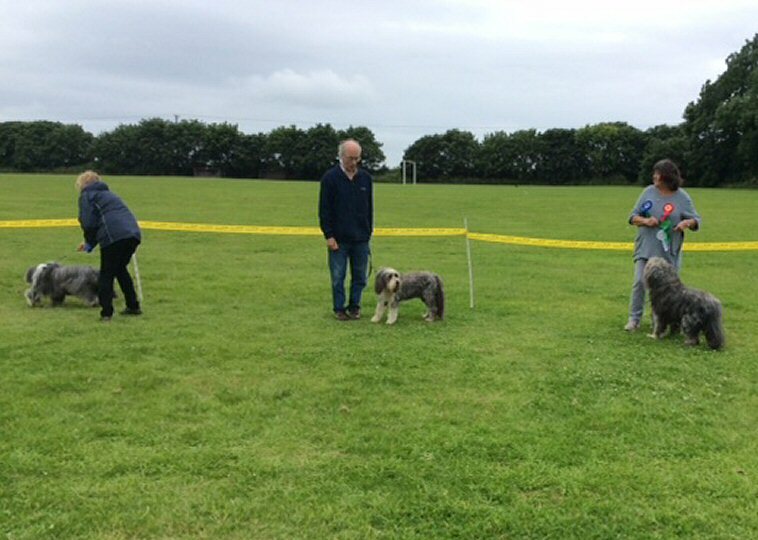 A big thankyou to Anita and Pat for organising the event, and to our Northern Branch friends who made the 200-mile round trip to join in the fun.